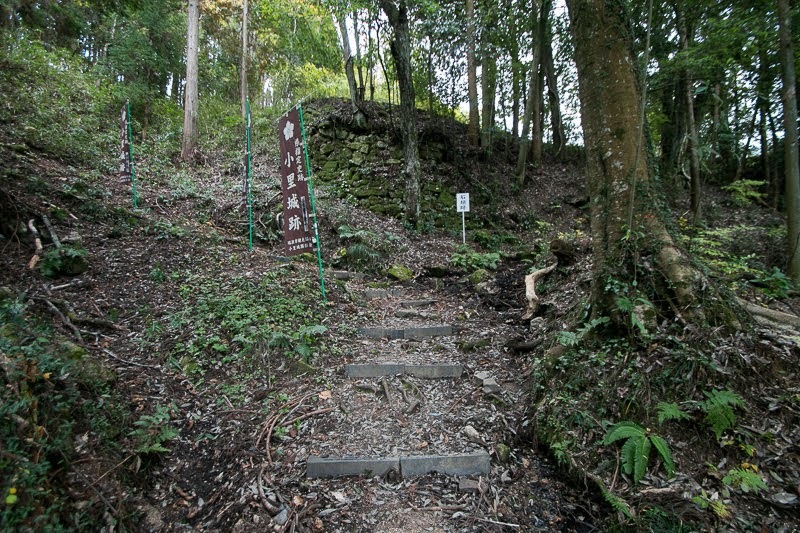 Ori castle (小里城) is located on Shiroyama mountain placed in Inazu area, about 5 kilometer southward from center of current Mizunami city. Mizunami city is at the east end of Nobi plain, and border of middle part and east part of Gifu prefecture. 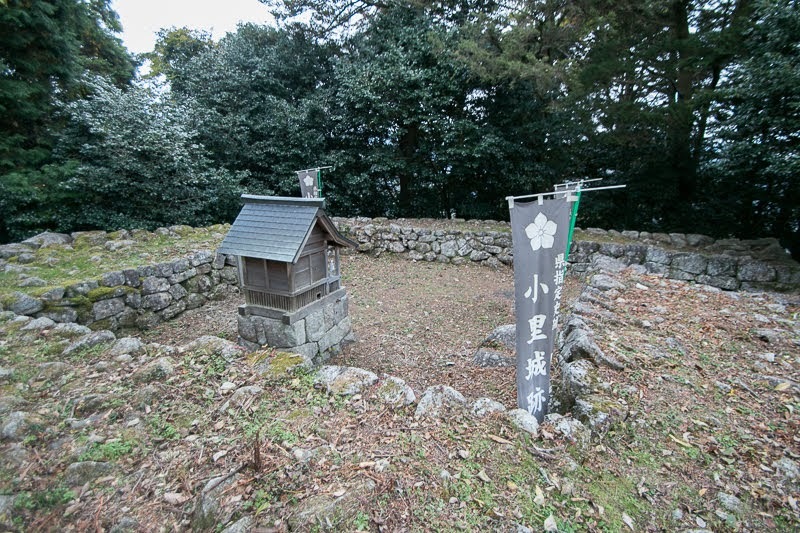 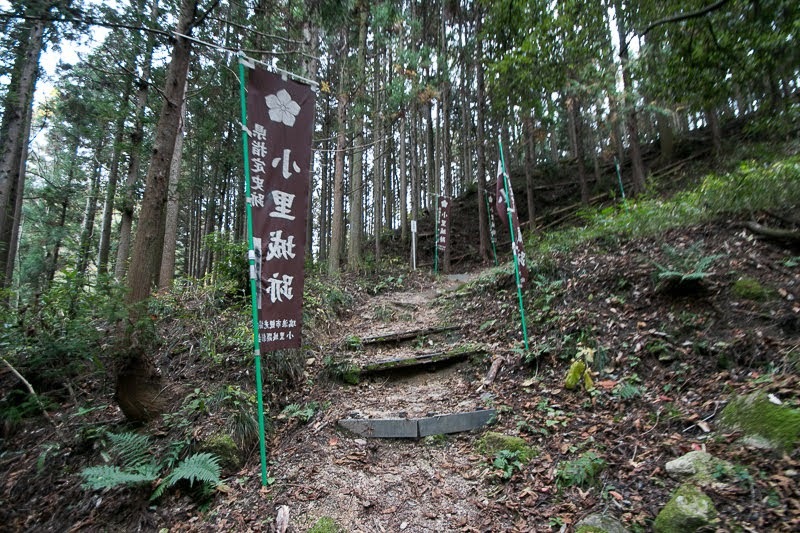 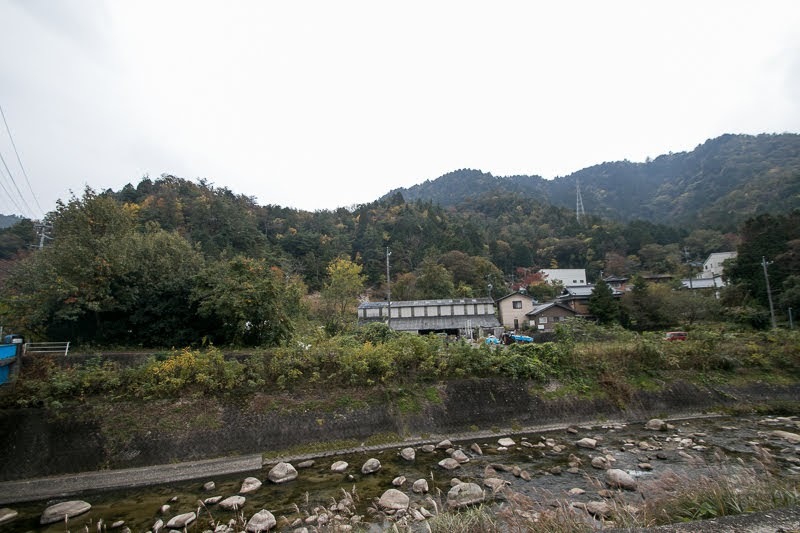 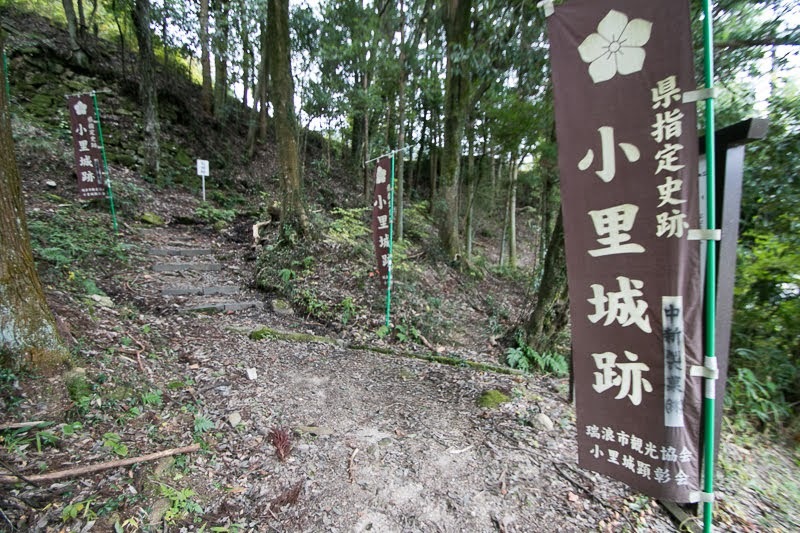 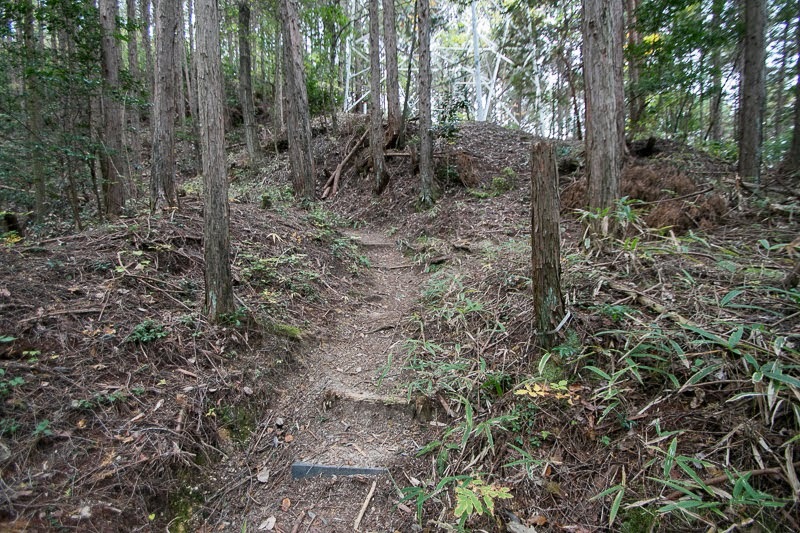 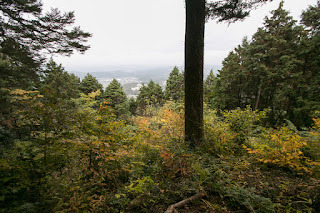 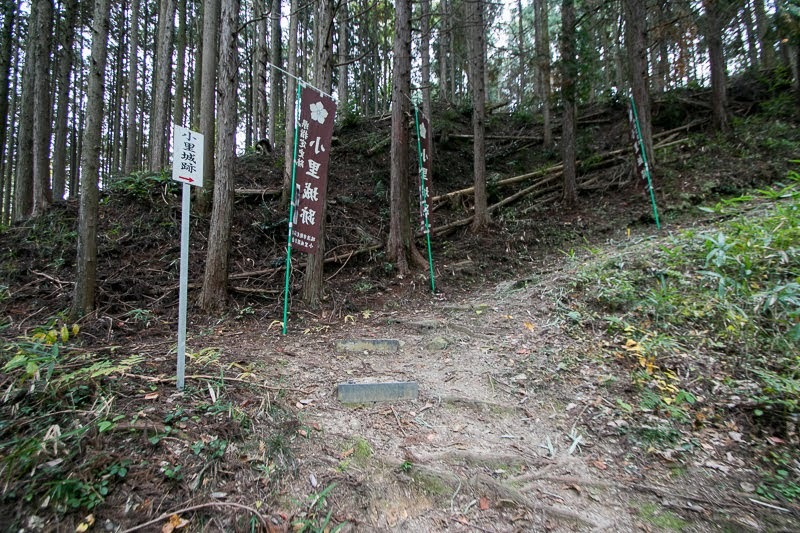 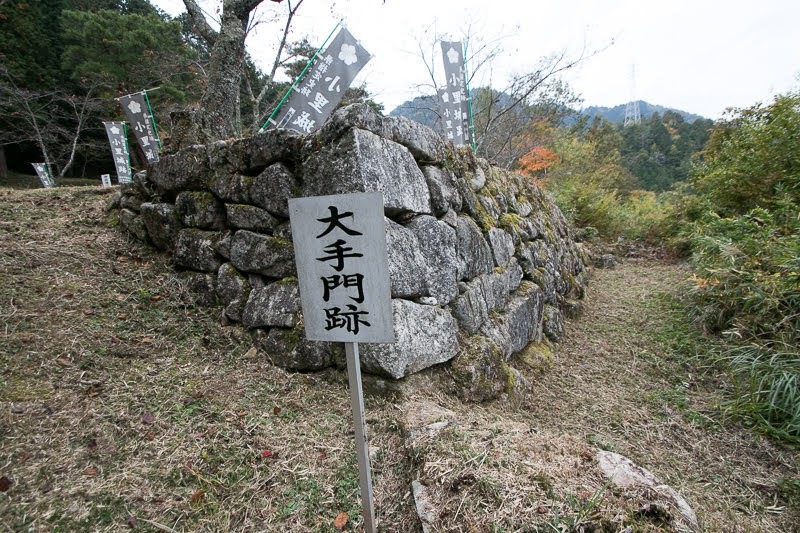 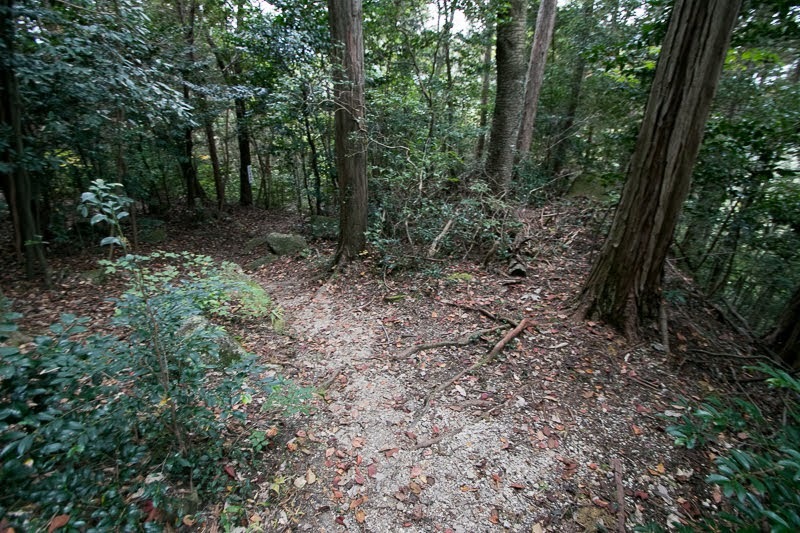 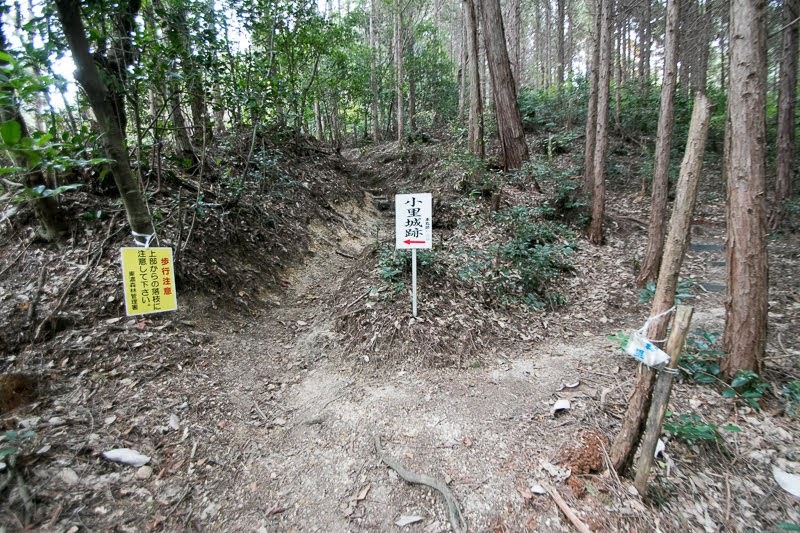 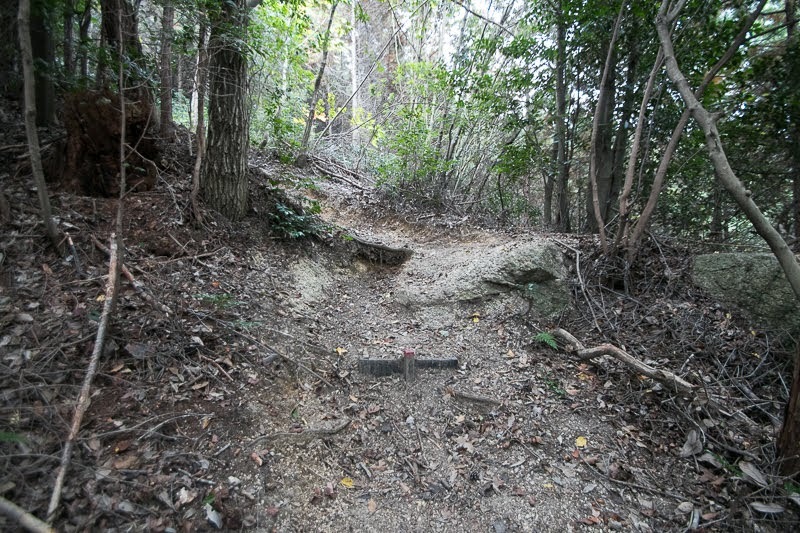 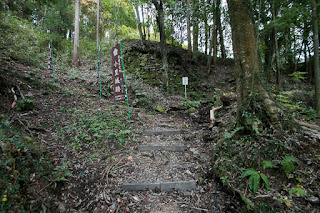 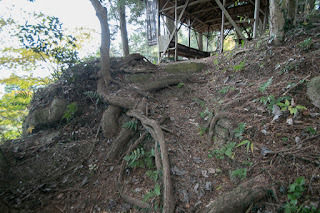 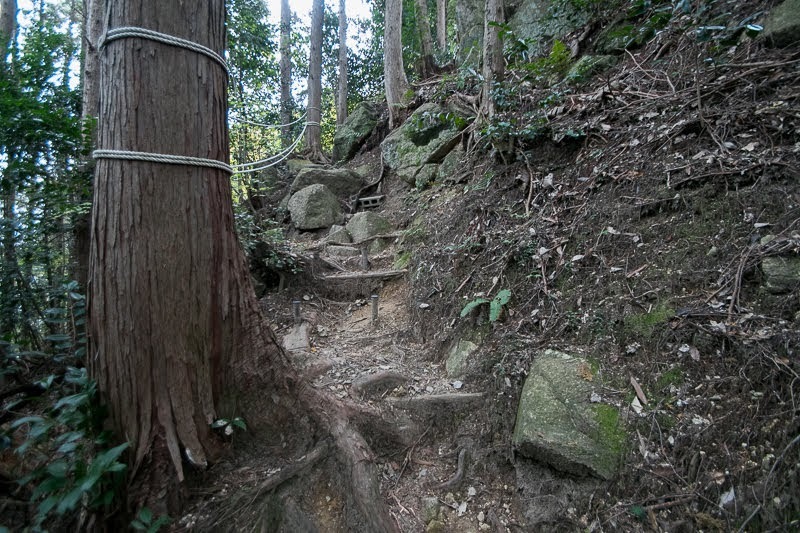 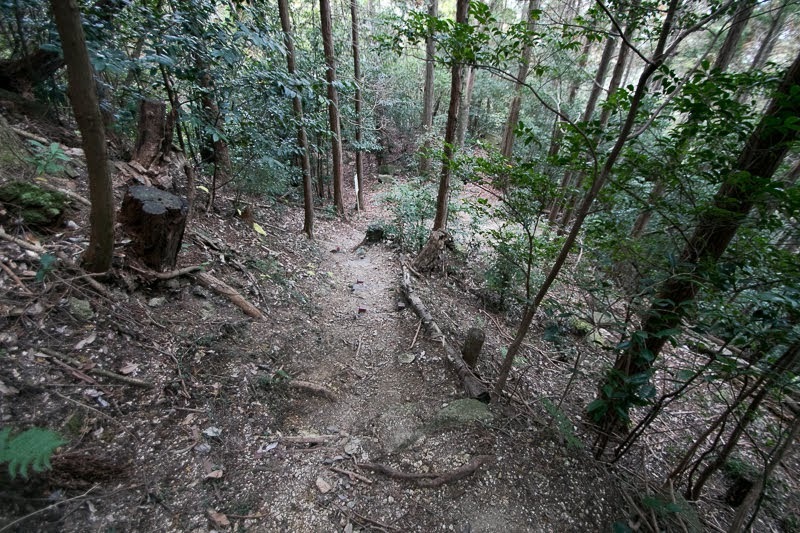 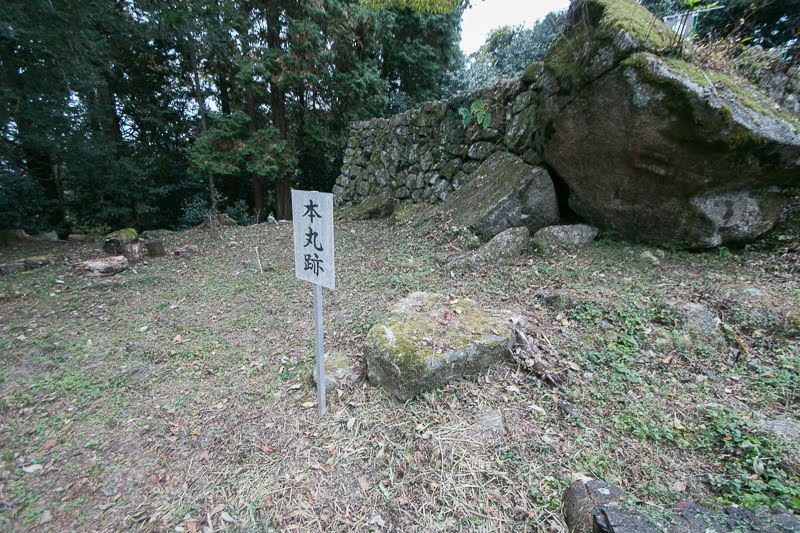 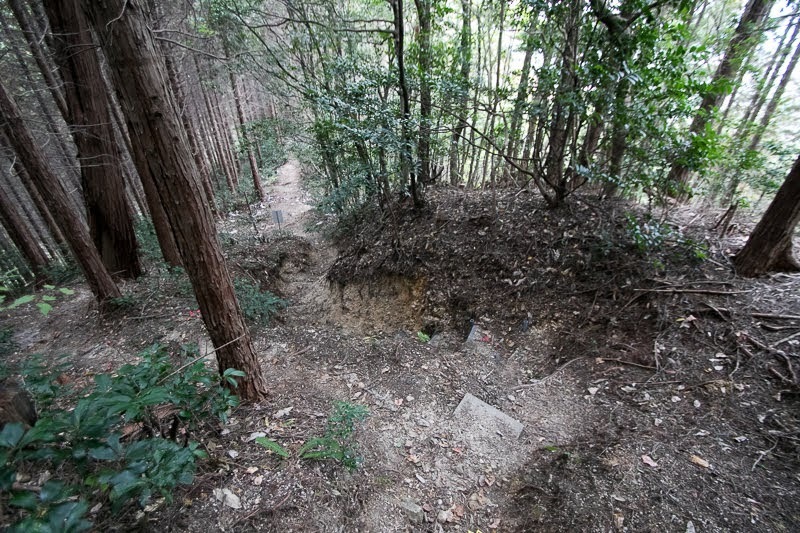 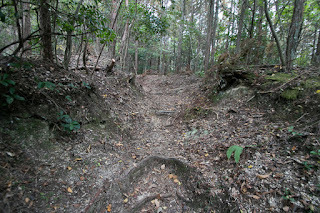 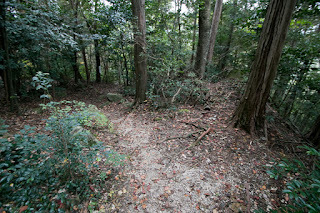 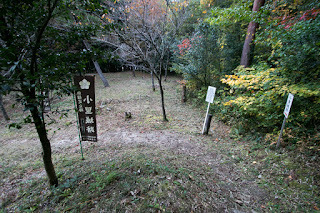 Castle site is an exit of the valley formed by Ori-gawa river flows into Nobi plain, and Shiroyama mountain looks like one of two gate palls with the mountain at the opposite of river. 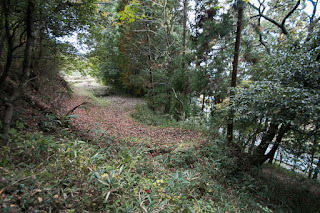 Ori-gawa river flows just at the next of Iwamura area, an important area in the southeast border of prefecture, and Ori area is like a natural gate between high wall toward east. 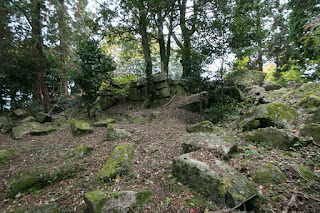 Precise year is unknown but Ori castle might be built by local lord Mitsutada Ori (?-?) 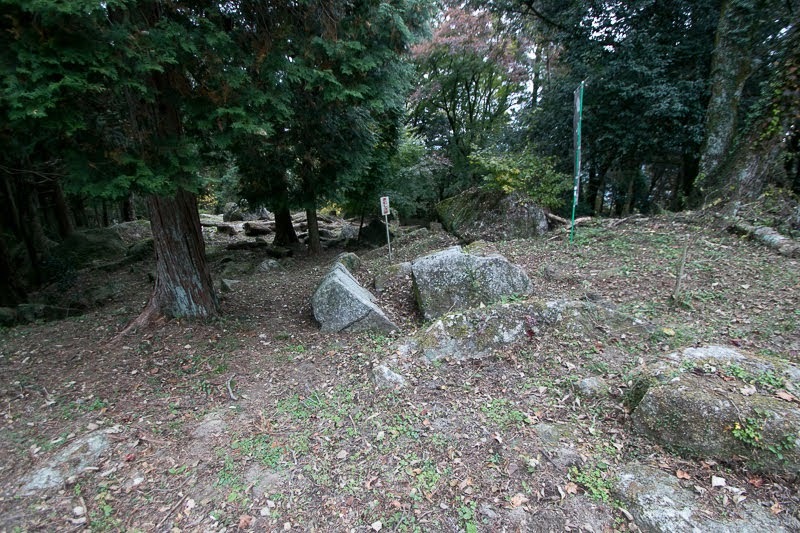 in the former half of 16th century. 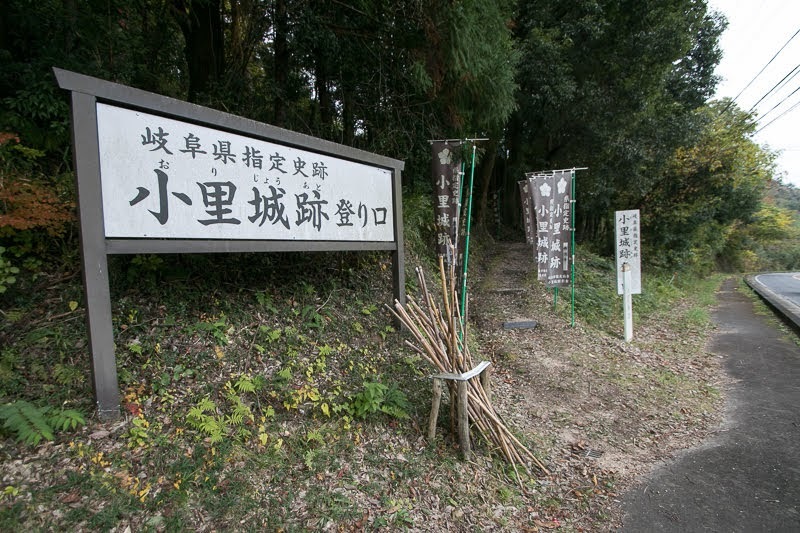 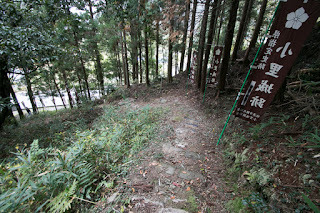 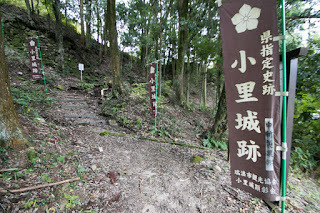 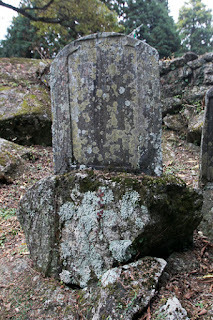 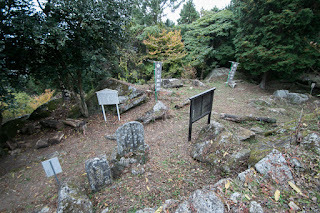 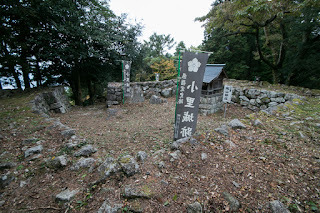 Ori clan was a branch family of Toki clan which was a major branch family of Minamoto clan and widely spread along Mino province (Gifu prefecture). 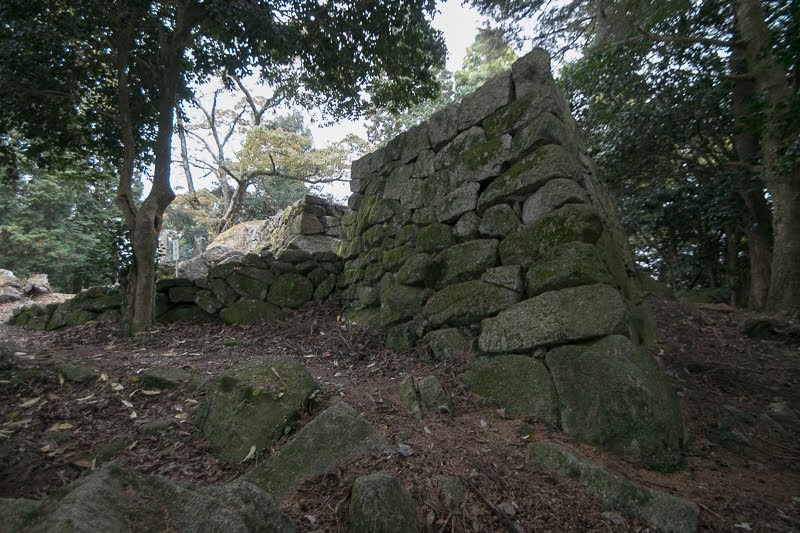 It is recorded that Ori clan once lost their territory by defeat in the battle and wandered, but Mitsutada recovered their land in 1536 and built a new castle on the mountain. 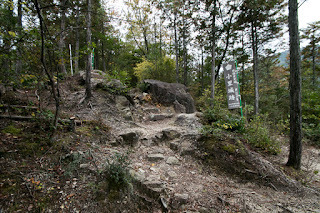 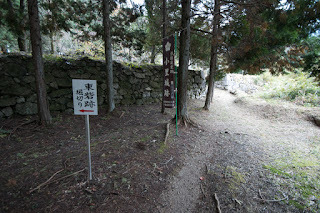 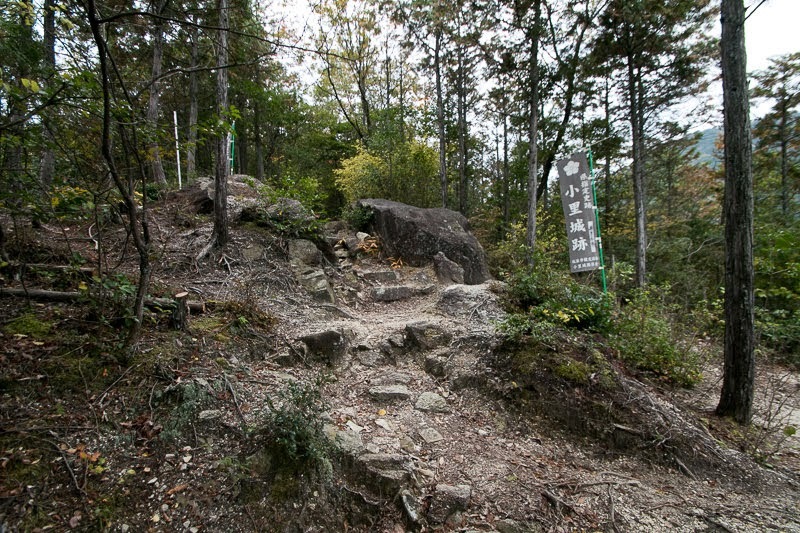 Around 1550, Mino province once became stabilized under Dosan Saito (1494-1556) who expelled former governor Toki clan and captured the province. 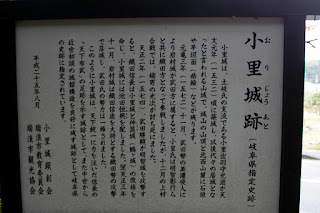 But in 1556 Dosan died in the battle against his son Yoshitatsu Saito (1527-1561), thus Yoshitatsu faced the attack of Nobunaga Oda (1534-1582), the warlord of Owari province (western half of Aichi prefecture) and so in law of Dosan. On the other hand, at the eastern border of Mino province, Shingen Takeda (1521-1573), the warlord of Kai province (Yamanashi prefecture), captured Shinano province (Nagano prefecture) and controlled local lords in eastern part of Mino province such as Toyama clan or Ori clan. 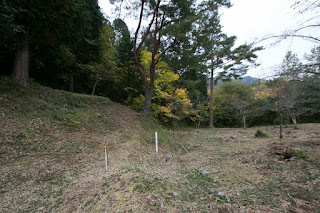 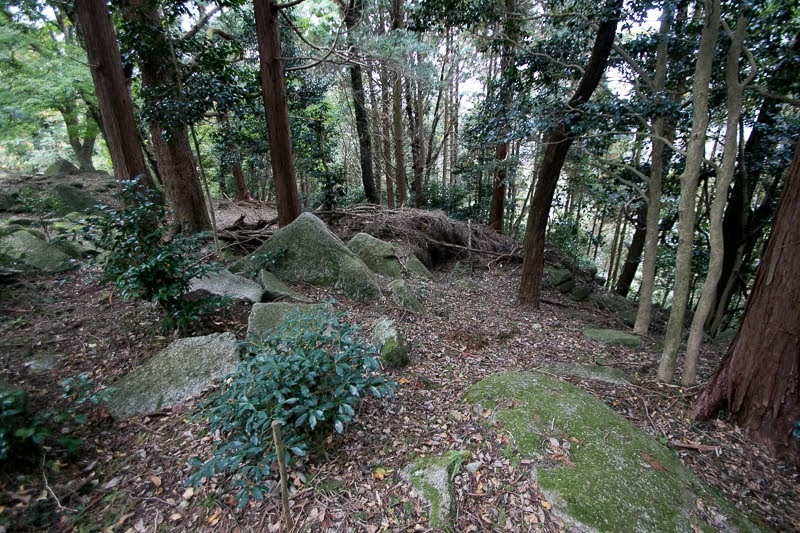 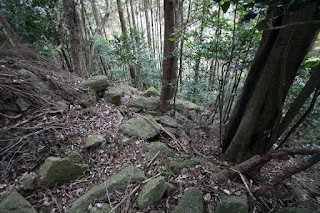 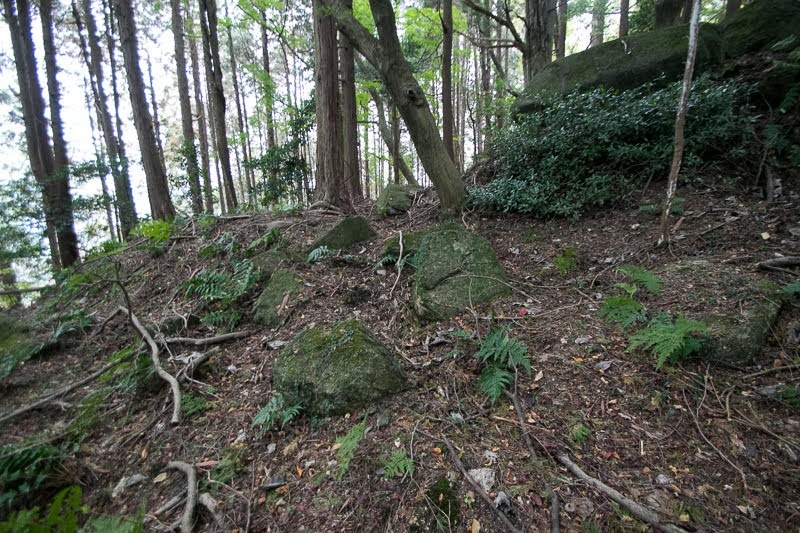 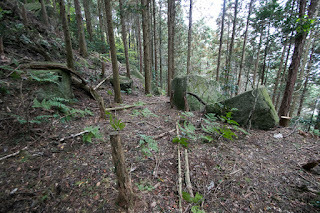 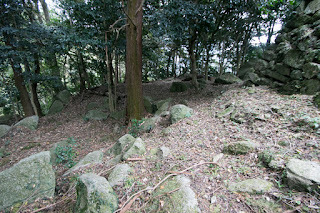 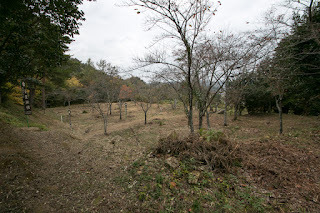 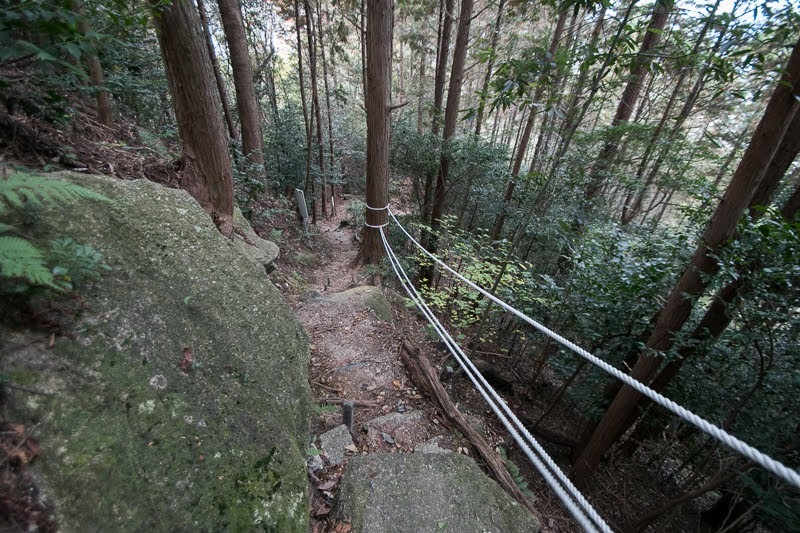 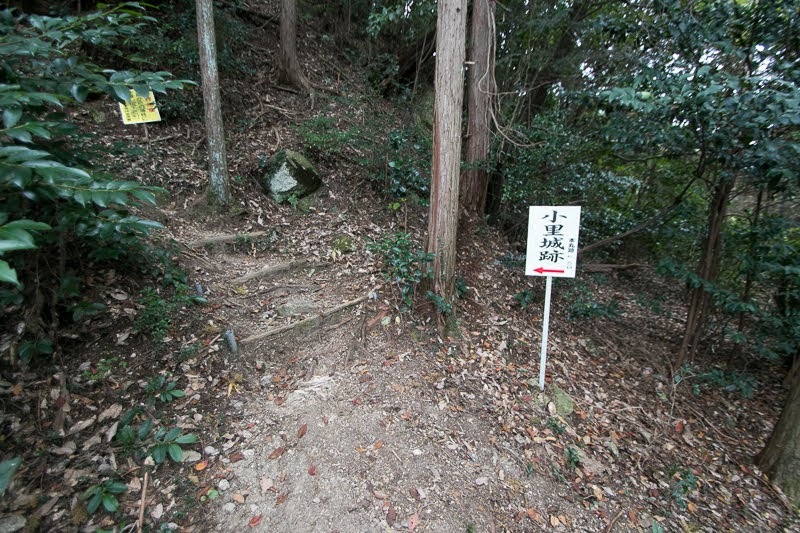 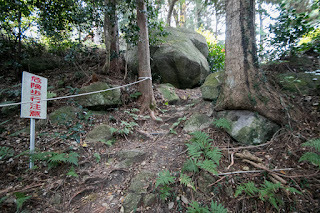 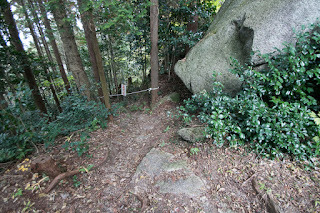 Once Nobunaga and Shingen allied, but they broke around 1570 and tension in this area significantly increased. 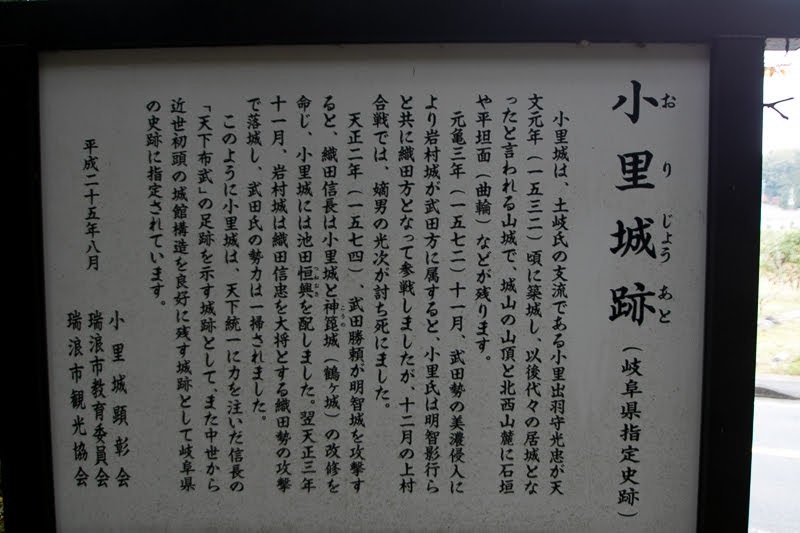 Since after break, vanguards of Takeda army intruded into Mino province or Mikawa province, where were the territory of Nobunaga and his ally Ieyasu Tokugawa (1543-1616), the warlord of Mikawa province (eastern part of Aichi prefecture). 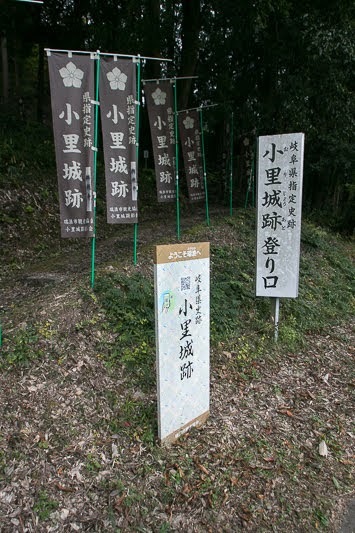 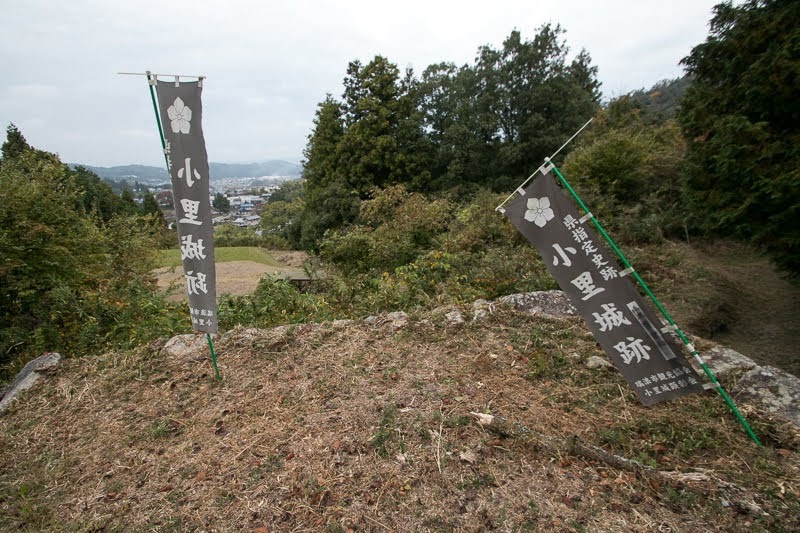 In 1570, Takeda army lead by its general Torashige Akiyama (1527-1575) broke Oda army near Iwamura castle (Gifu prefecture), the main base of Toyama clan, and the leader of Ori clan died in this battle. 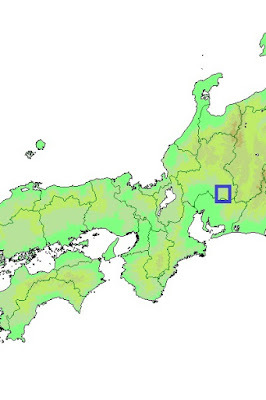 In 1572, Shingen at last started his campaign against Nobuanga Oda and Ieyasu Tokugawa and marched toward westward. 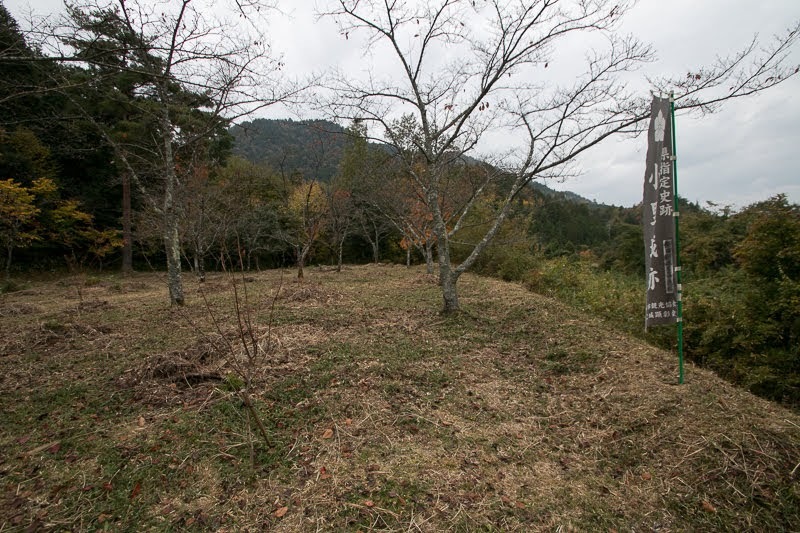 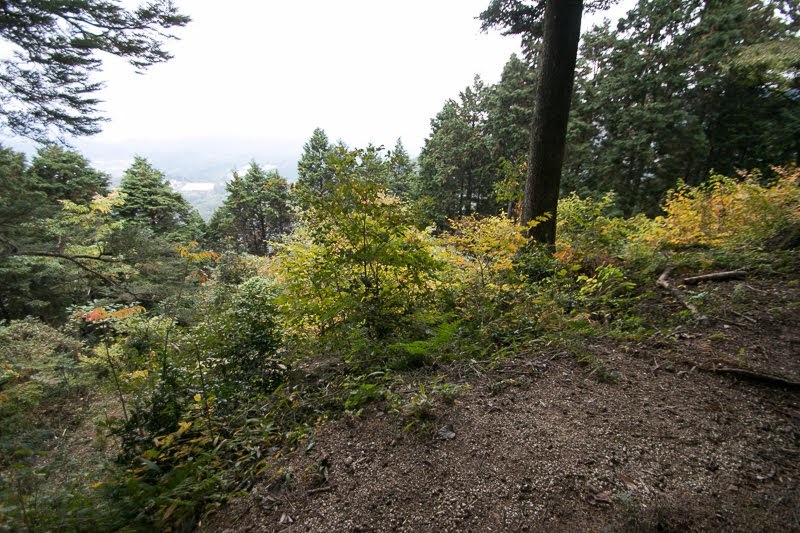 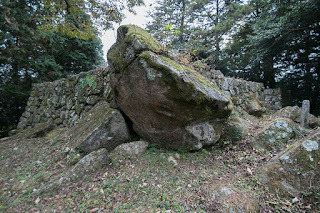 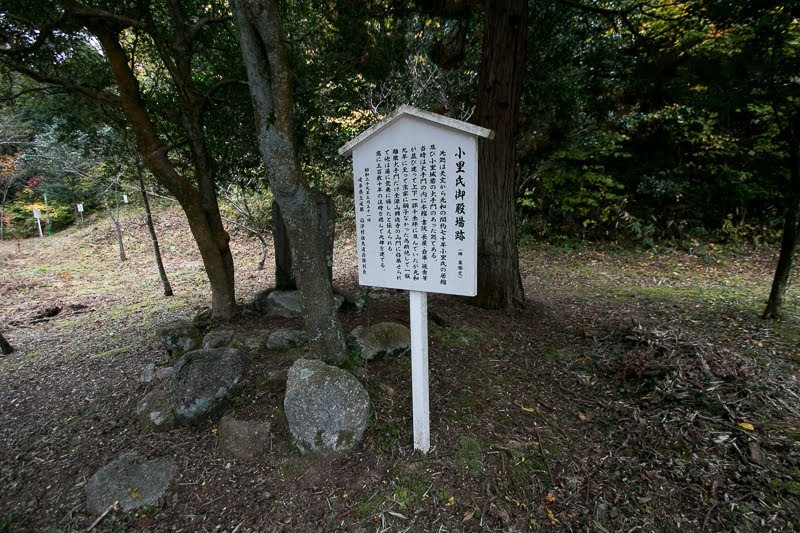 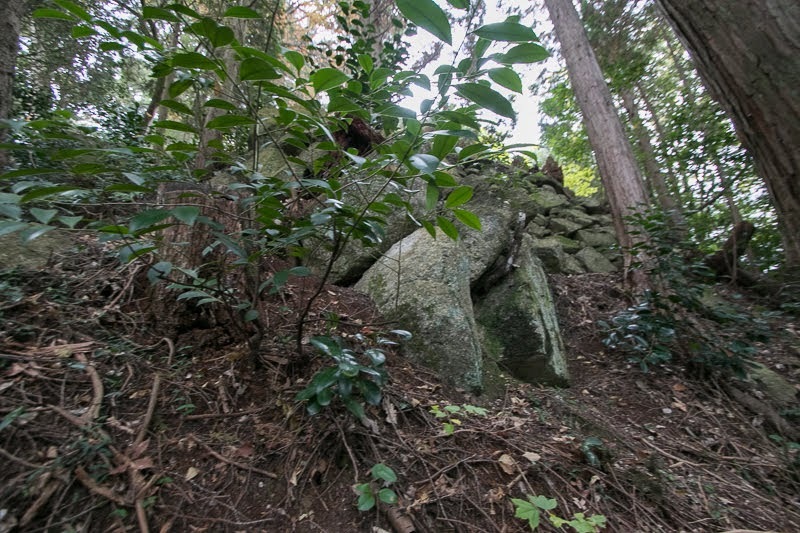 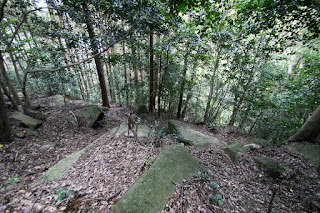 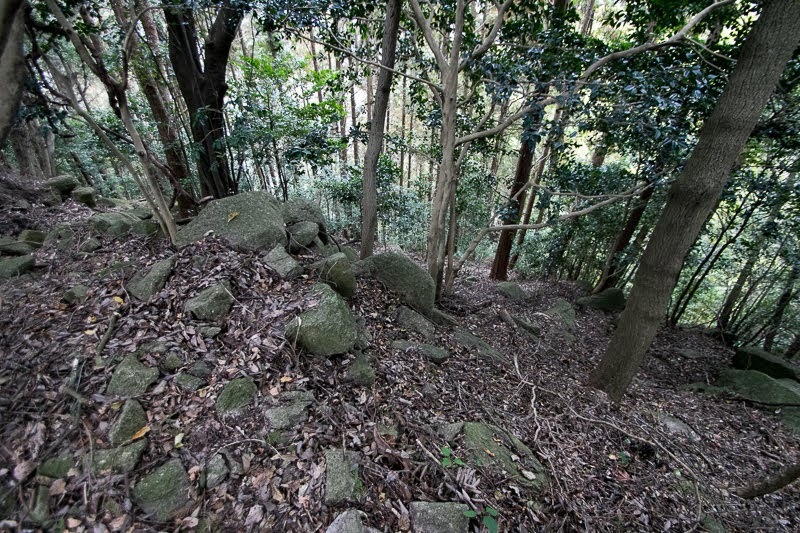 Shingen assaulted Totomi province (western part of Shizuoka prefecture) held by Ieyasu, and broke allied army of Ieyasu and Nobunaga at the battle of Mikatagahara in that winter. 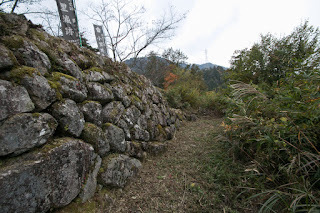 At the same time, Shingen sent a detached force lead by Torashige Akiyama to Mino province. 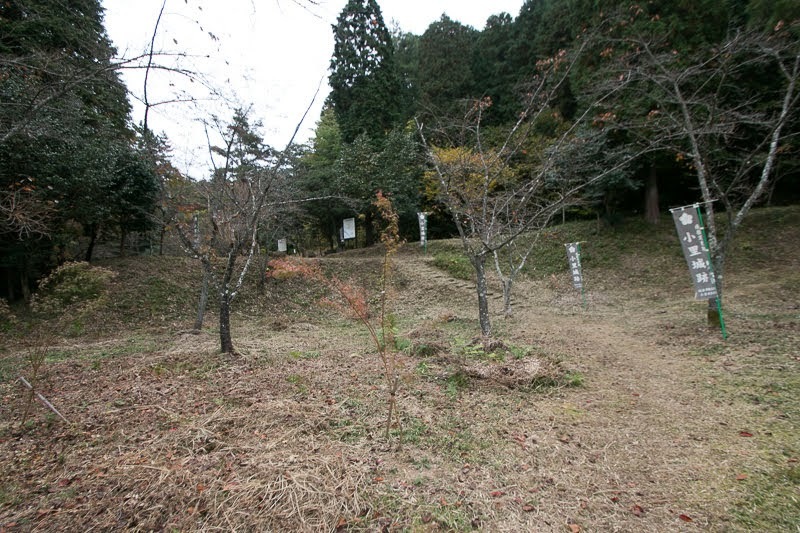 In the spring of 1573, Torashige captured Iwamura castle (Gifu prefecture), the main base of Toyama clan by marriage with female lord Princess Otsuya. 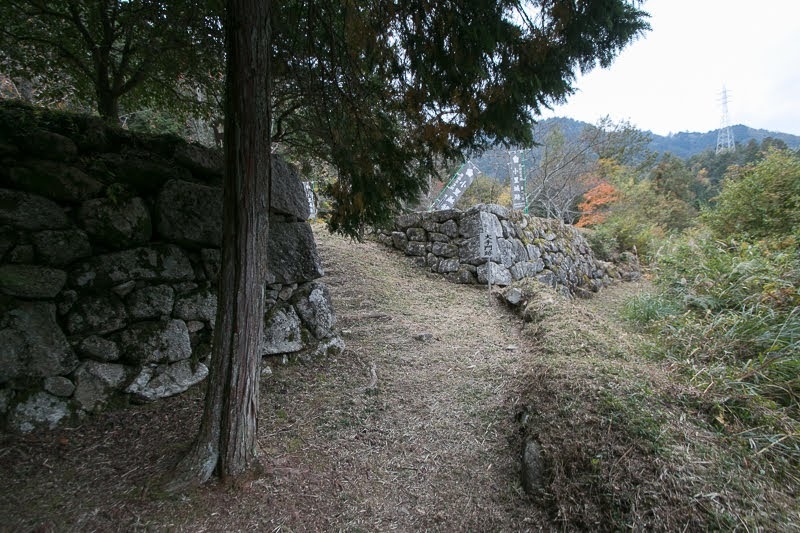 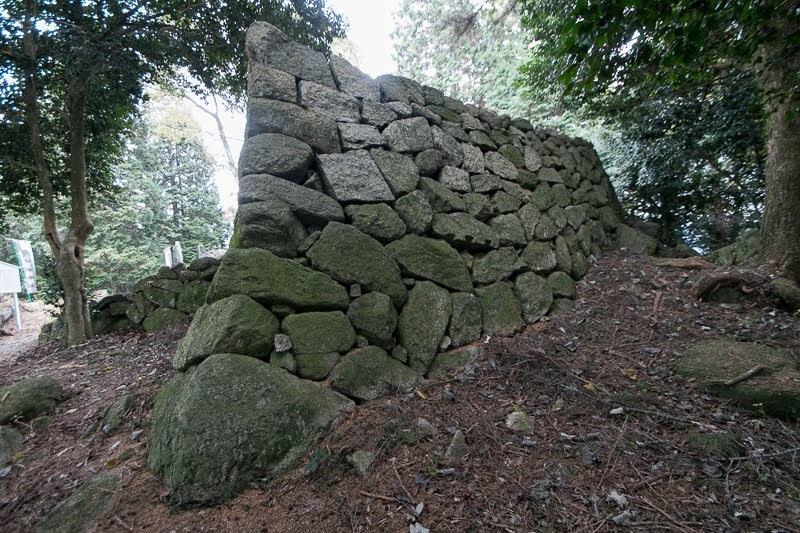 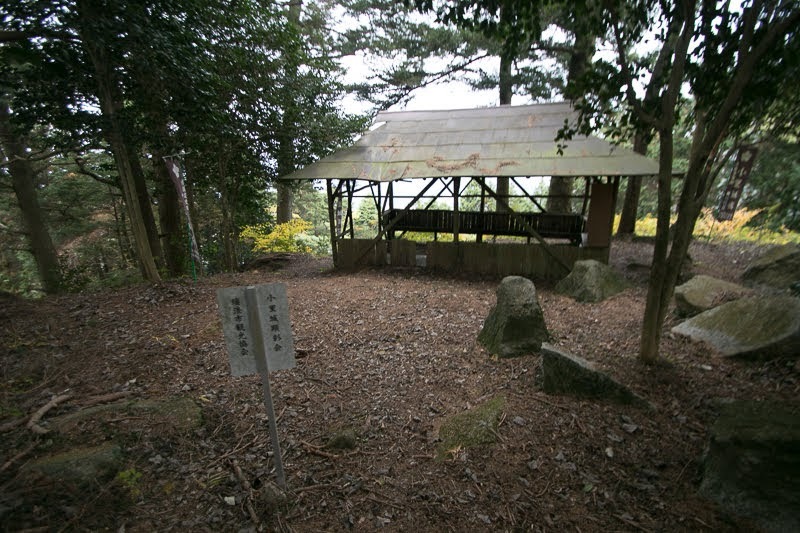 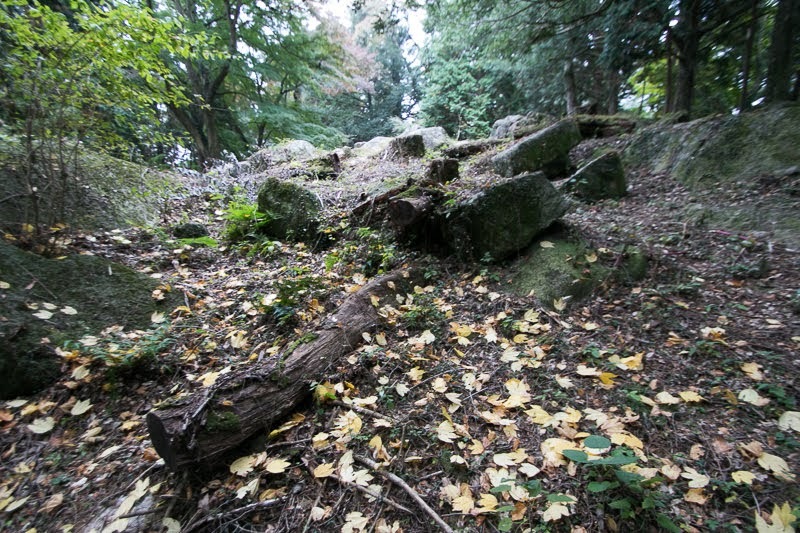 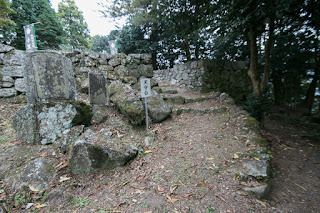 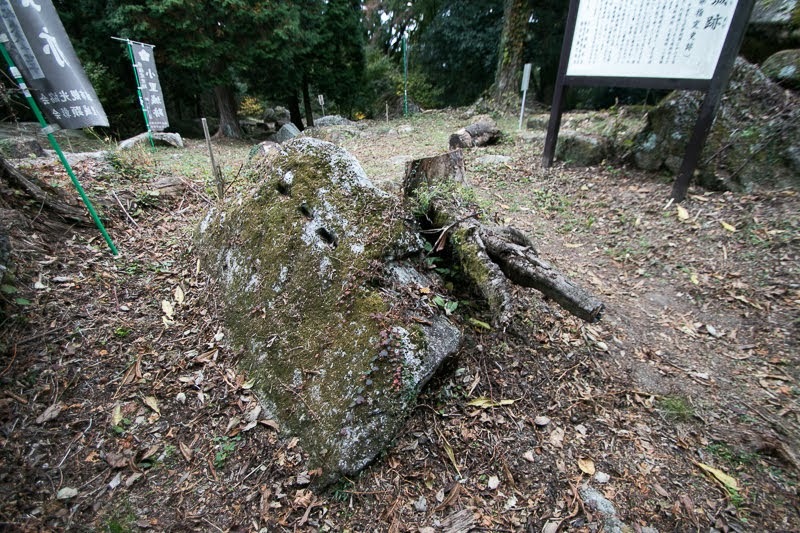 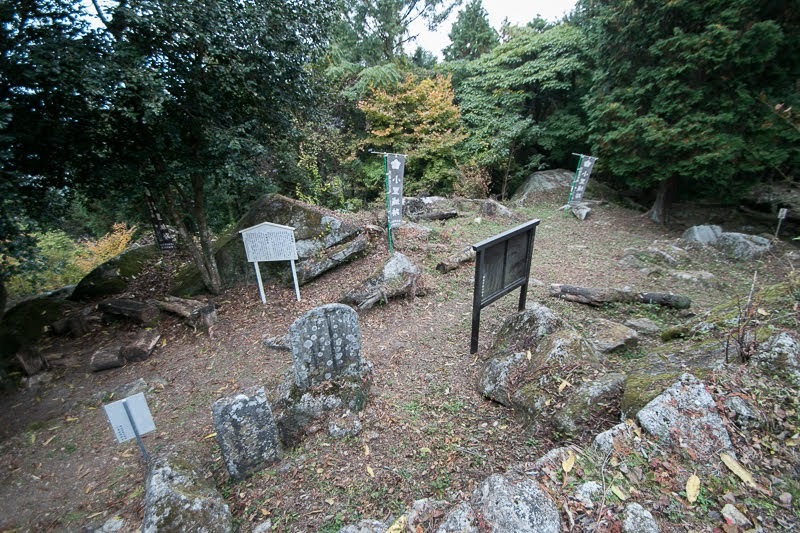 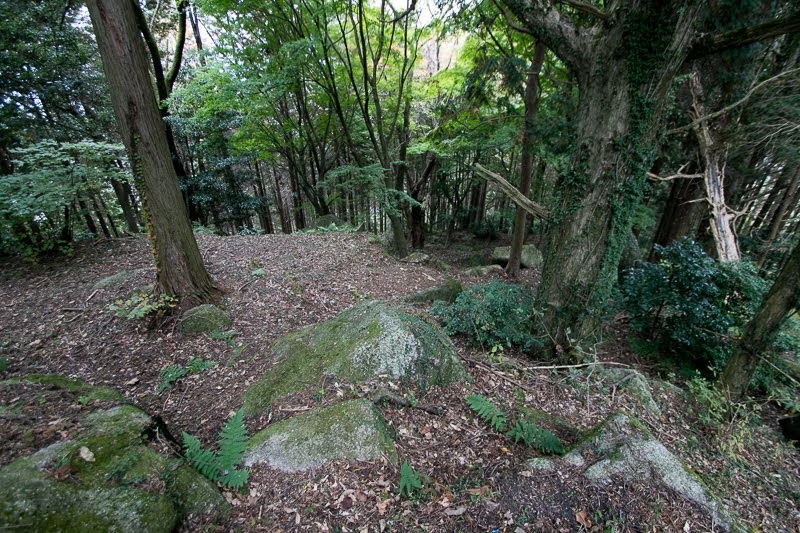 However, just after the capture of Iwamura castle, Shingen died in ill thus campaign was cancelled. But losing Shingen, Takeda clan was still strong under his successor Katsuyori Takeda (1546-1582). Takeda clan recovered from the loss of Shingen again attacked Mino province and Mikawa province in 1574. 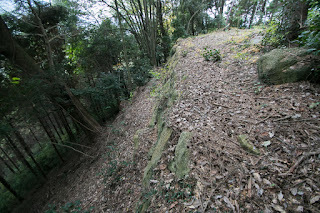 It was necessary to stop the intrusion of Takeda army from Iwamura castle into middle part of Mino province at Ori area thus Nobunaga ordered Ori clan to improve Ori castle. Ori castle roughly consist of hilltop castle and hillside residence. 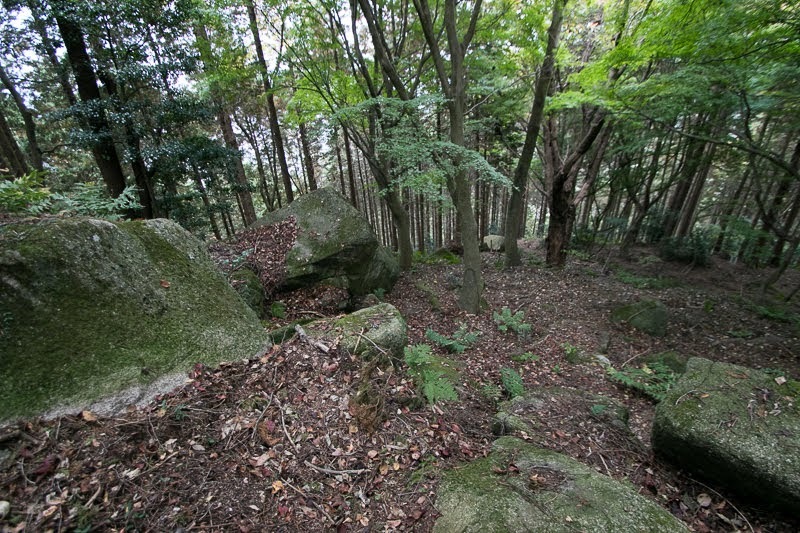 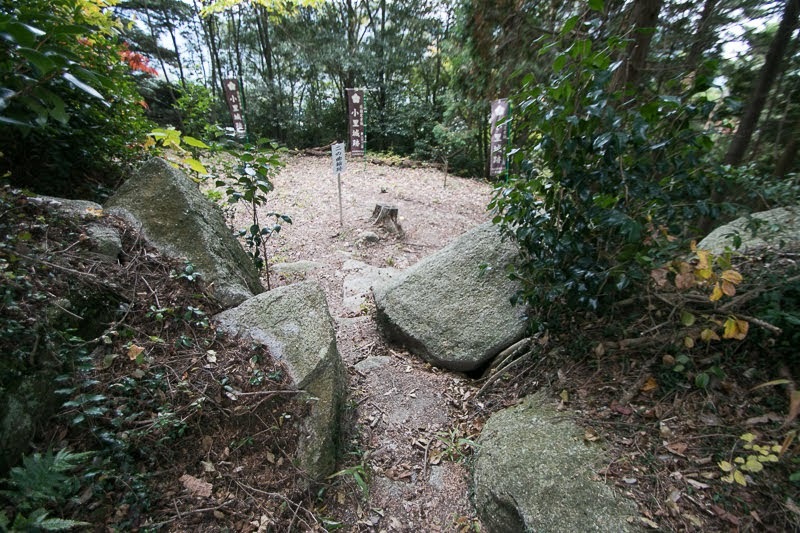 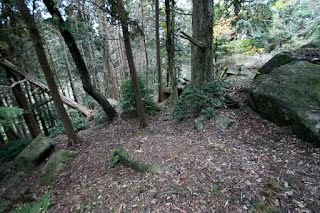 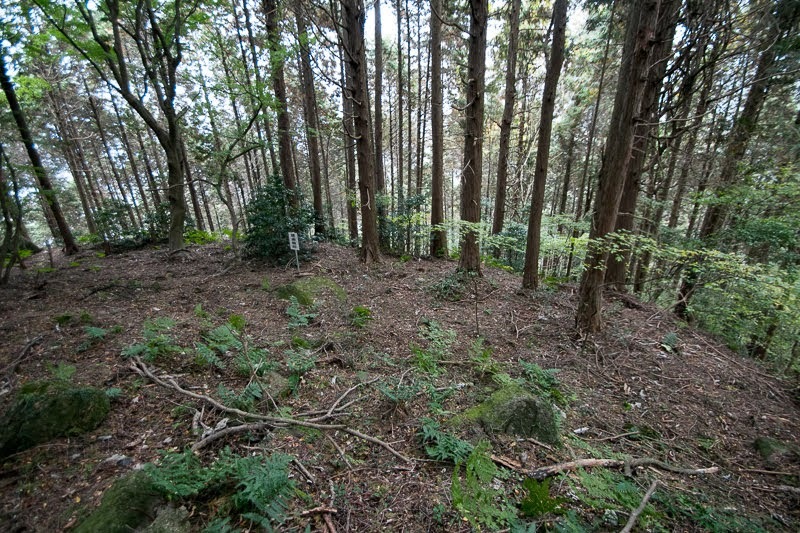 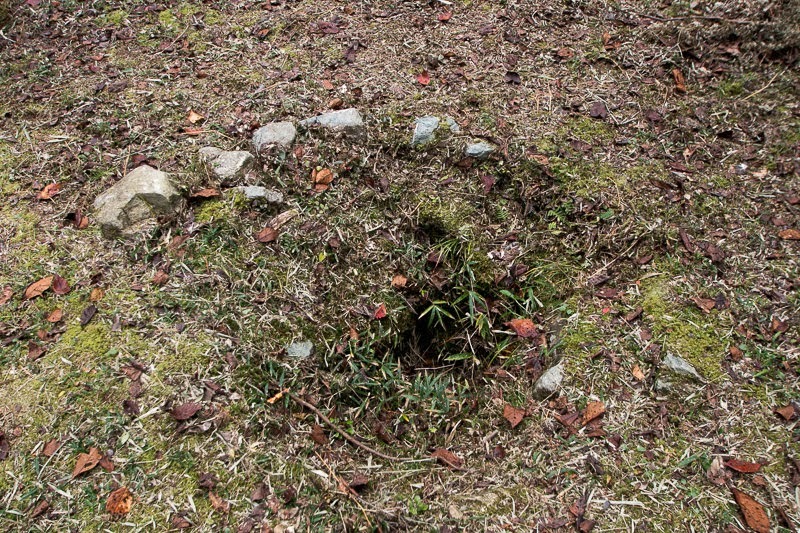 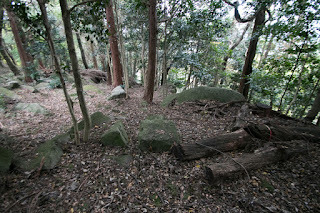 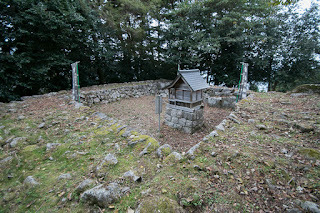 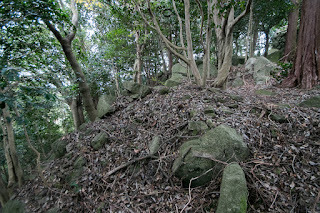 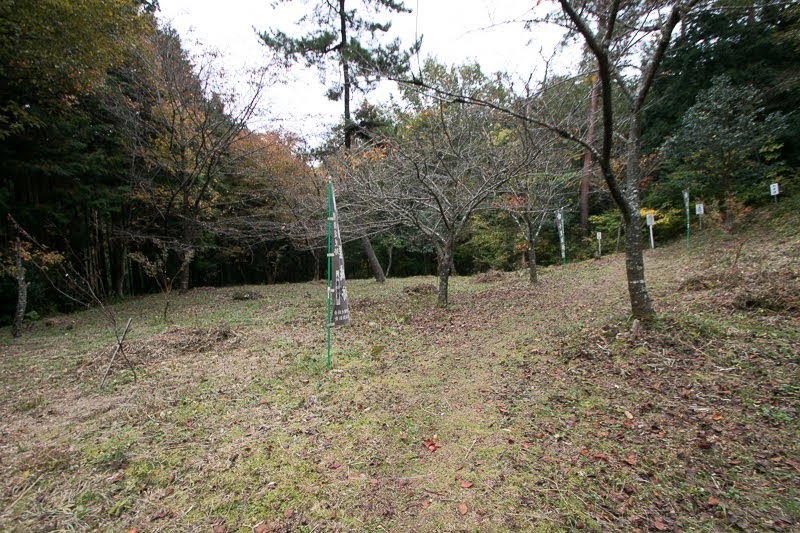 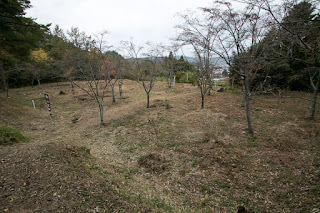 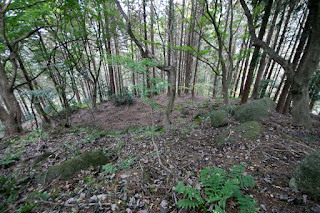 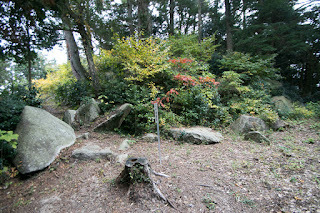 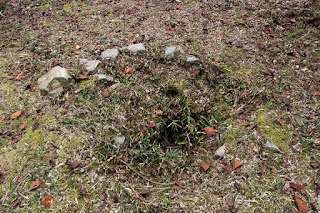 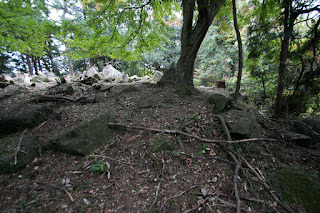 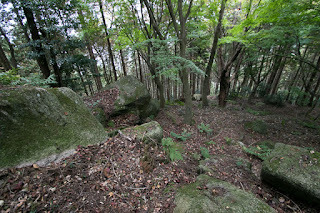 Hilltop area is roughly a circle shaped one of 50 meter diameter, which had a stone built basement of main tower. This basement is roughly a 10 meter long square shaped one with basement floor in inside, and even though reformed in later period original stone walls still remain on its western and southern line. 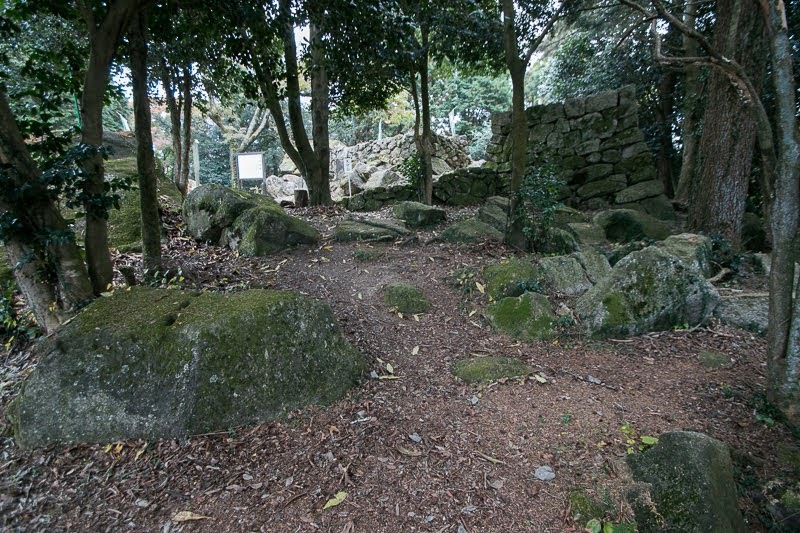 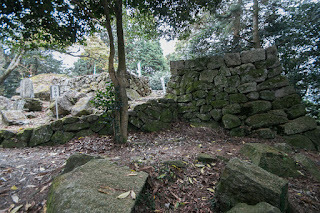 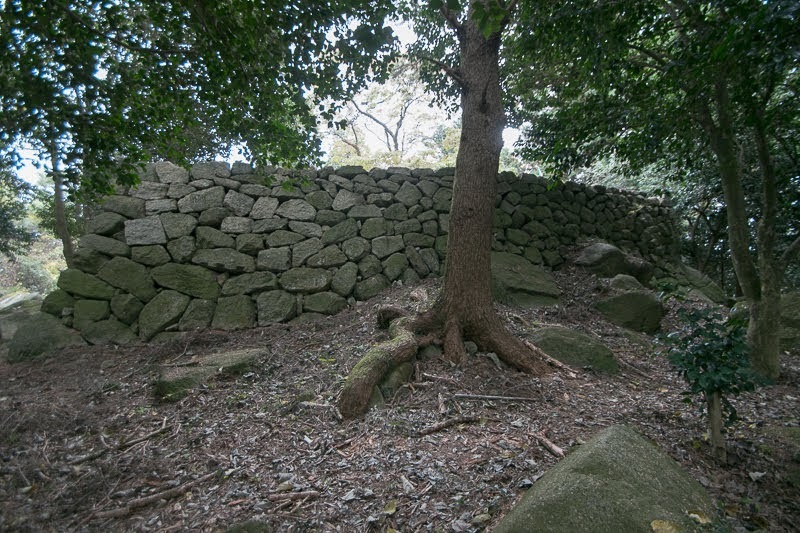 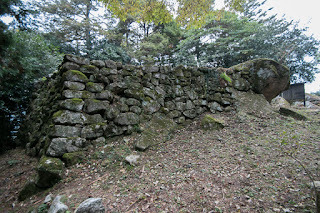 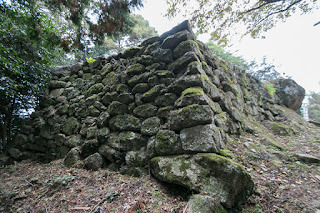 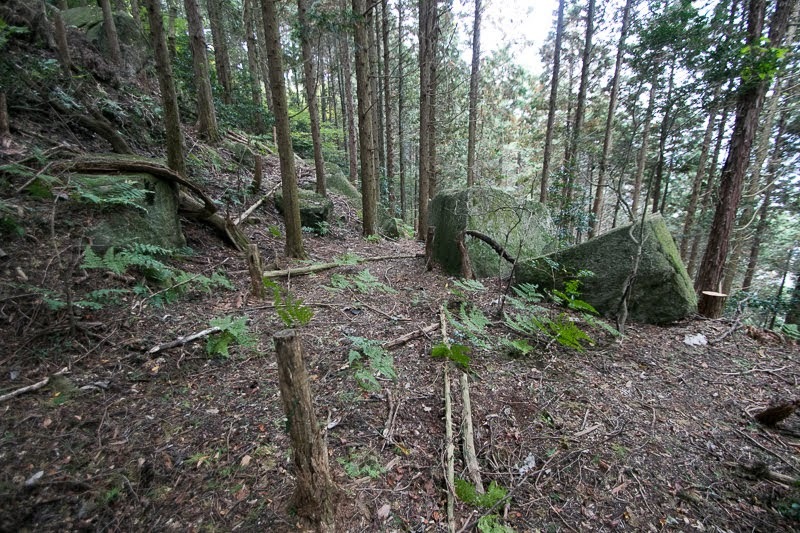 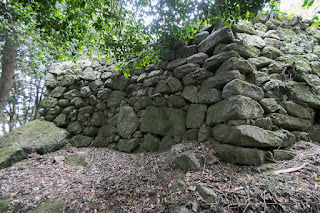 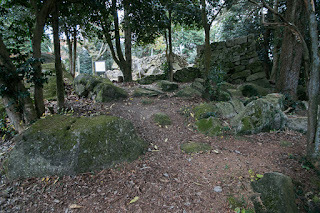 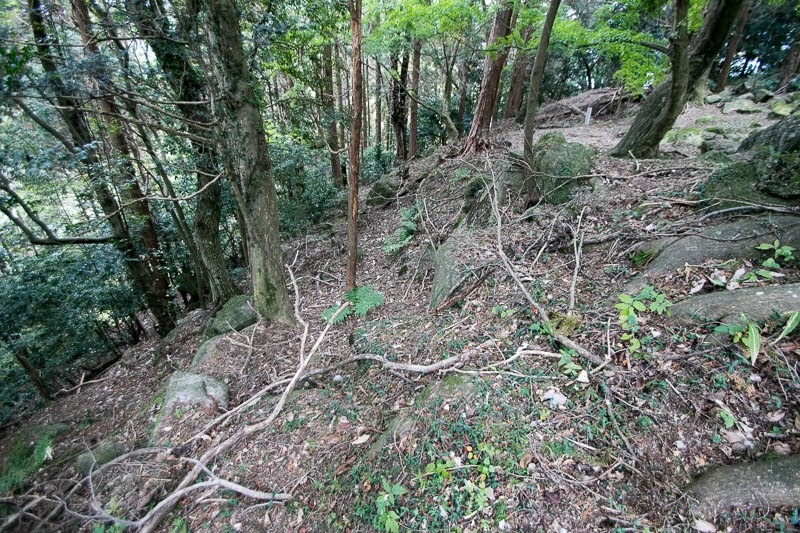 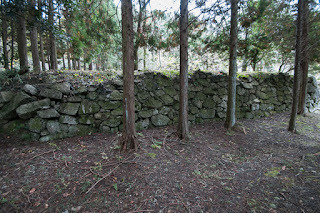 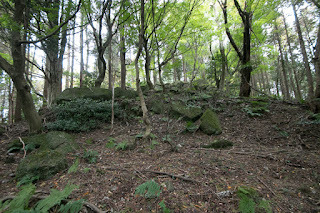 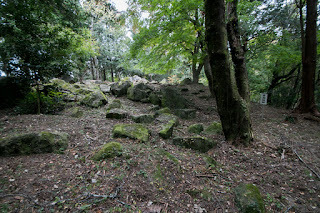 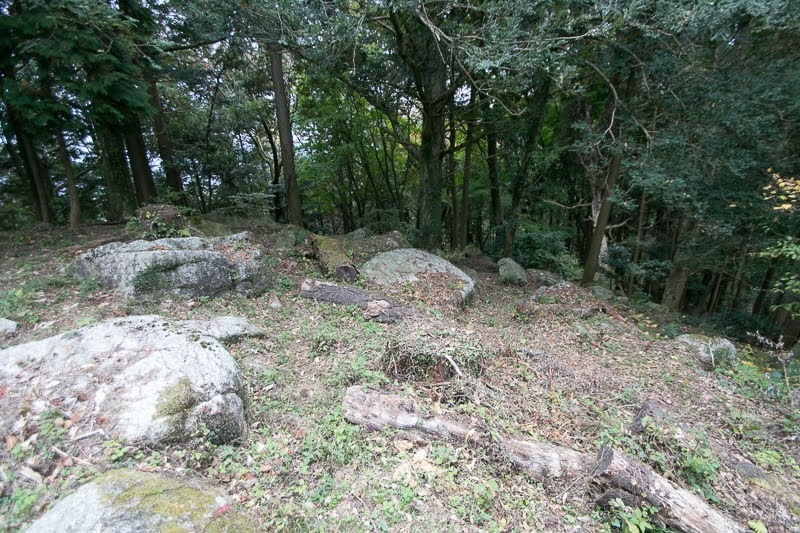 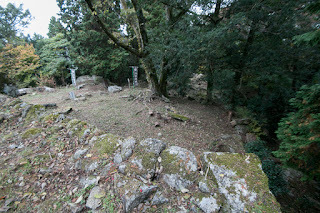 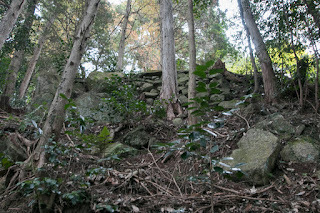 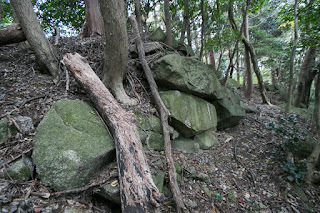 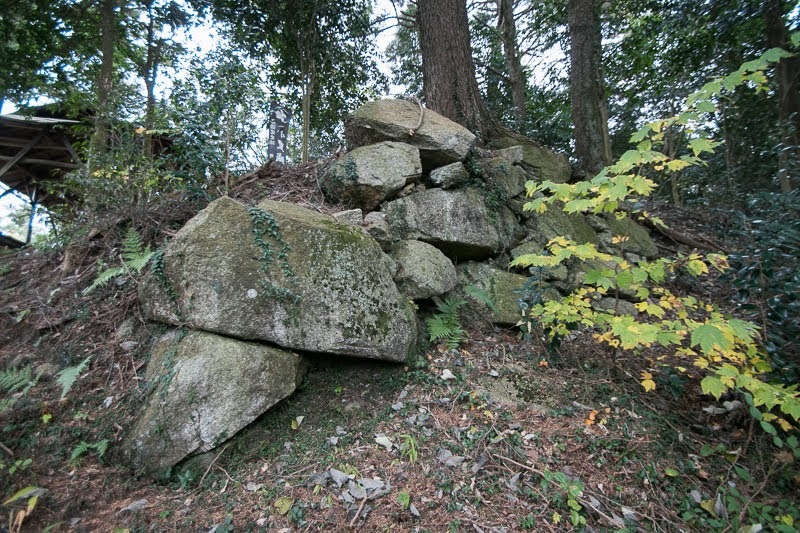 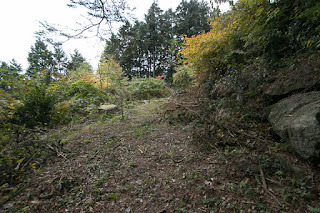 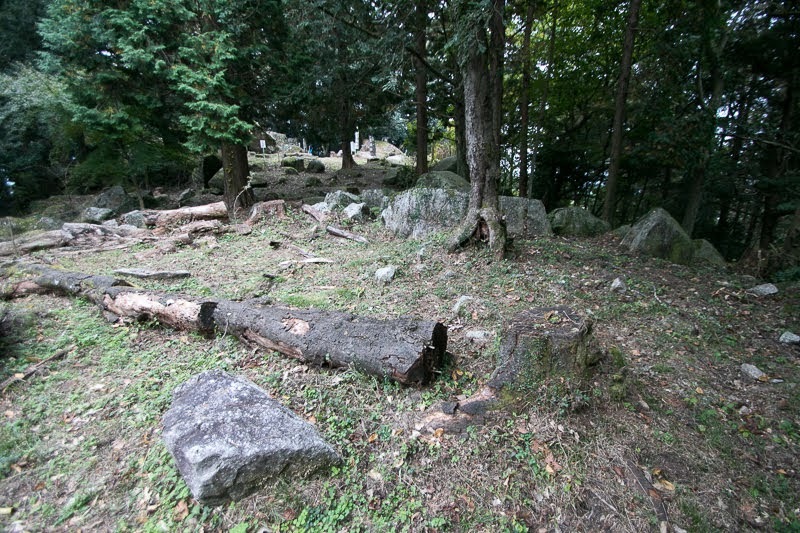 North half of central area are surrounded by stone walls and there might be backside gate at its western line. 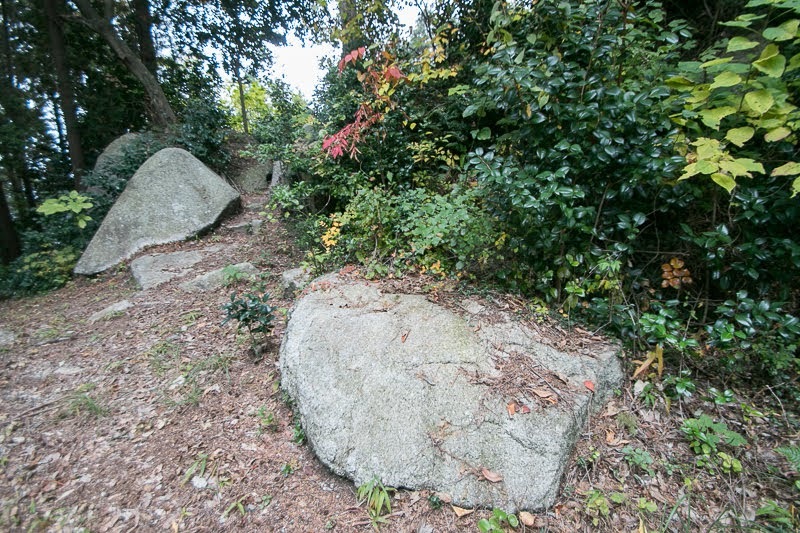 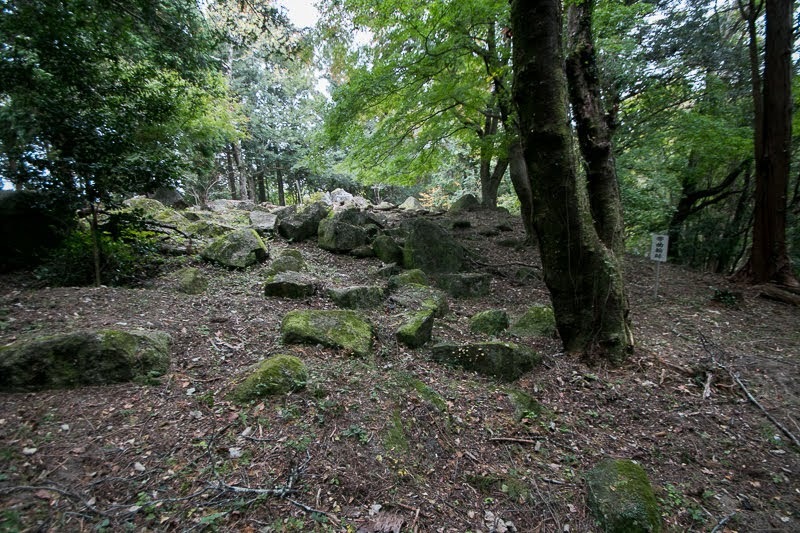 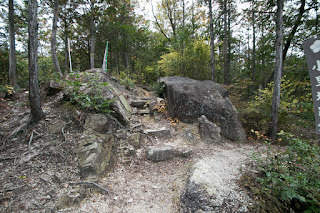 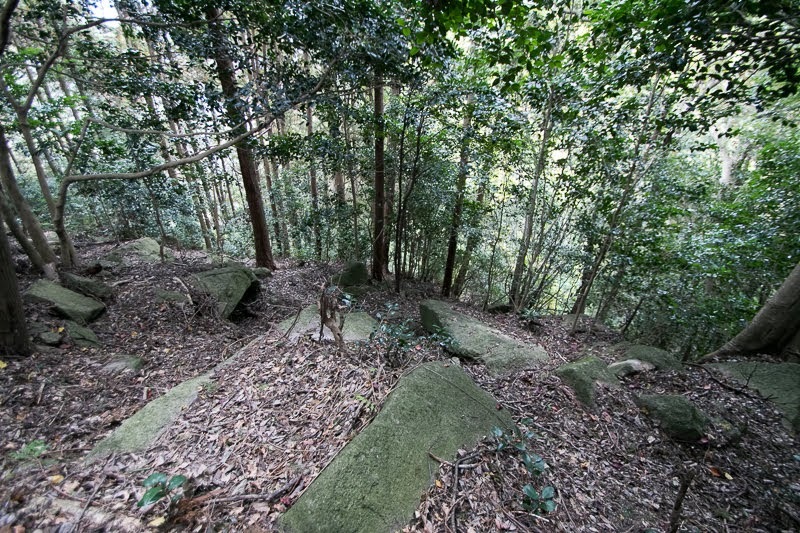 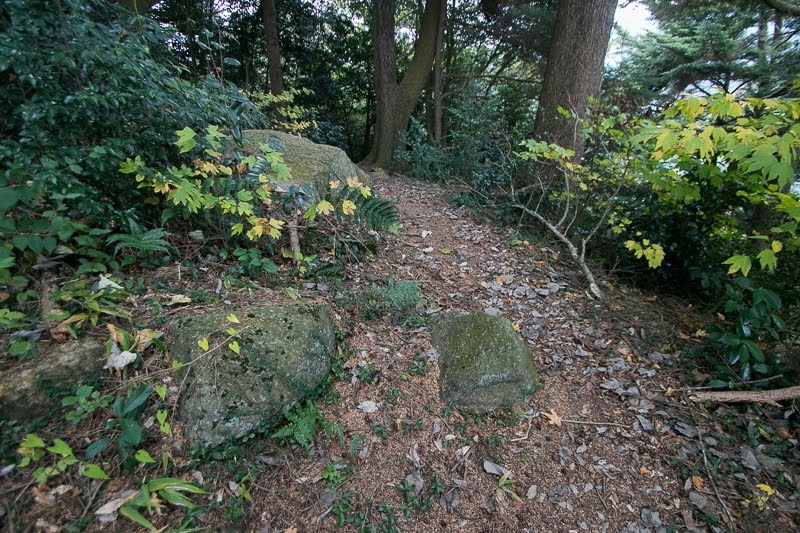 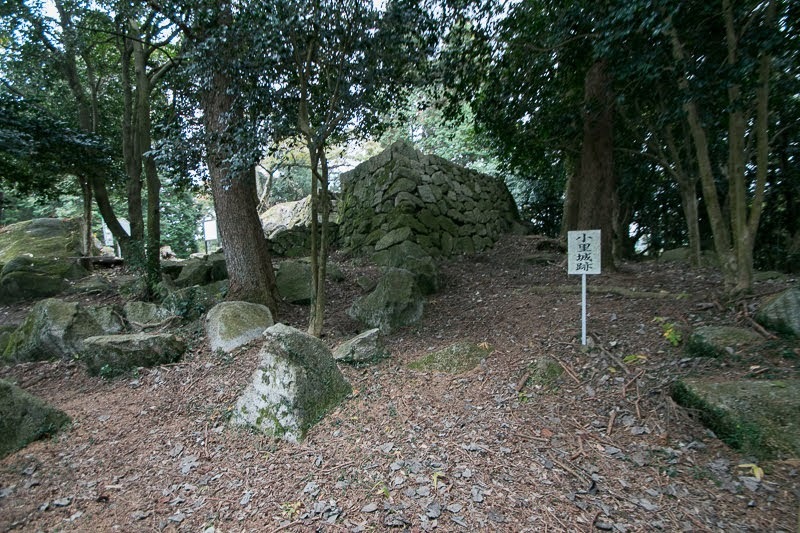 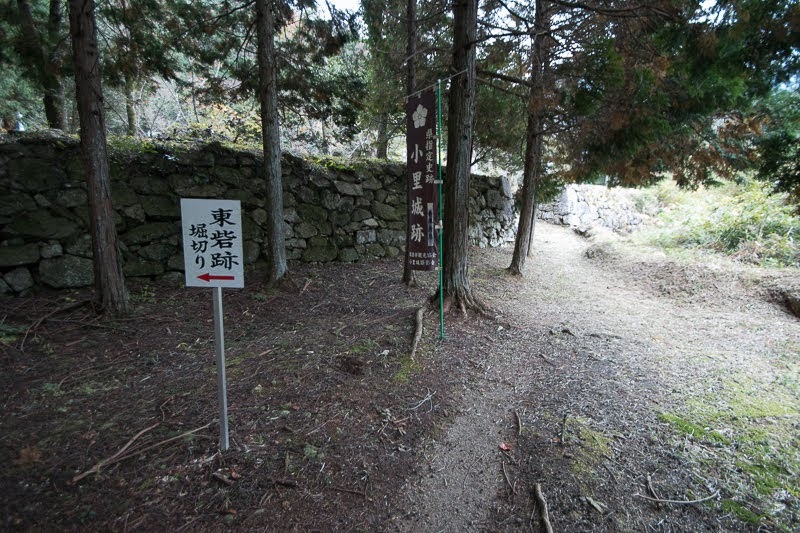 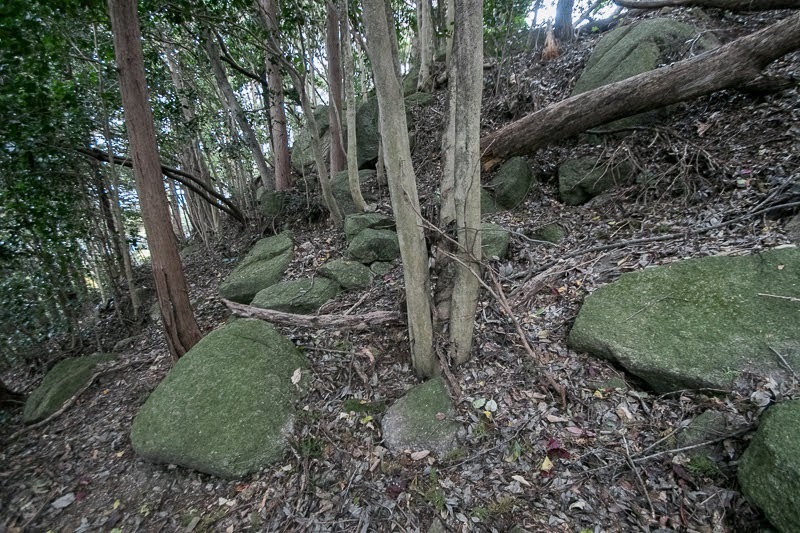 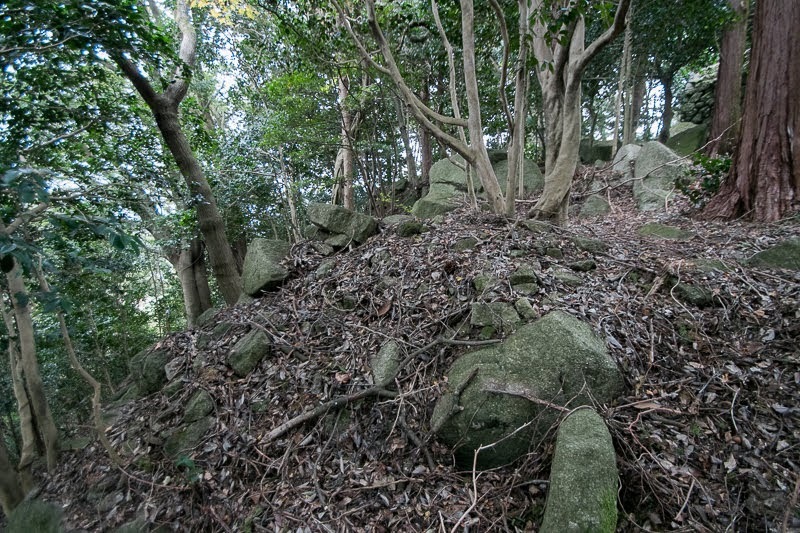 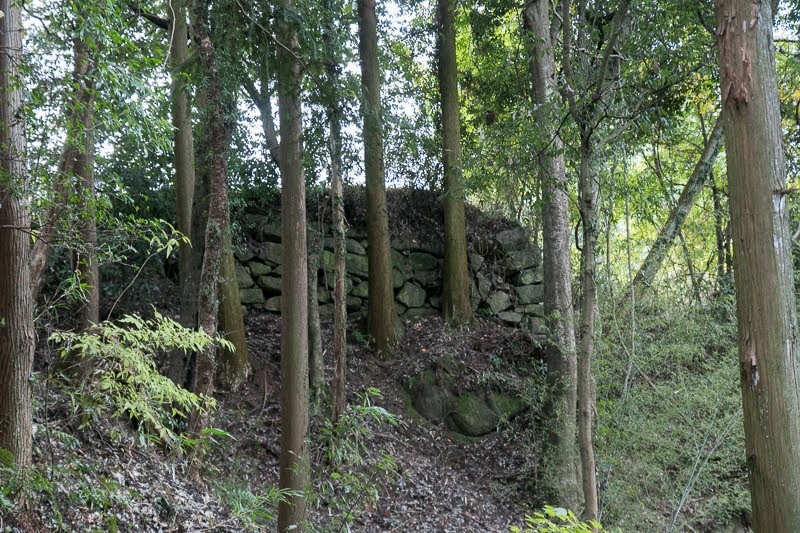 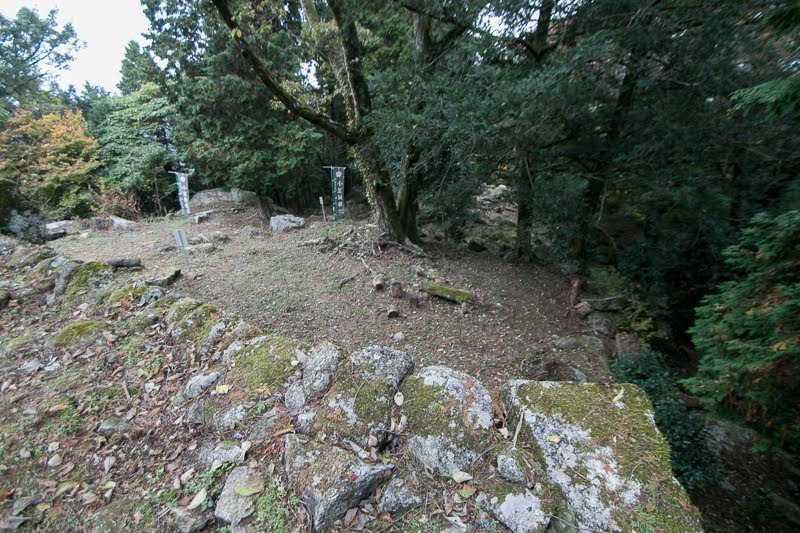 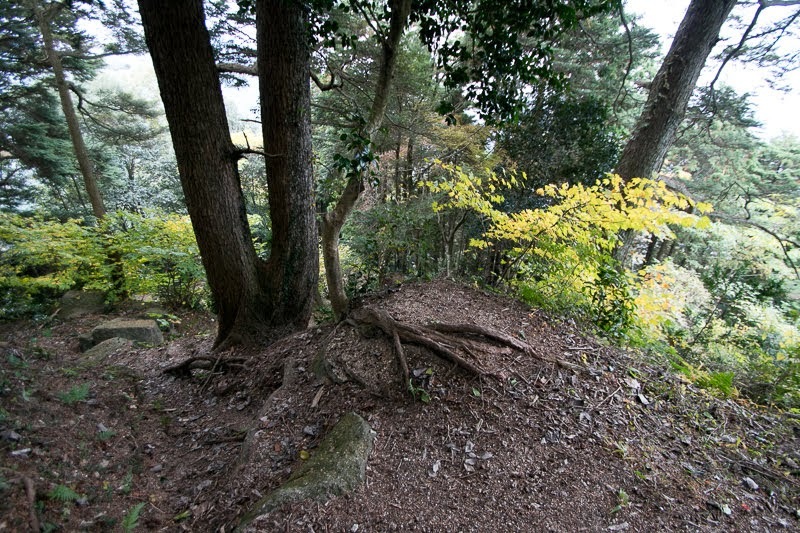 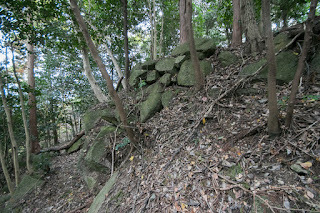 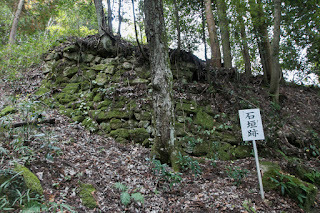 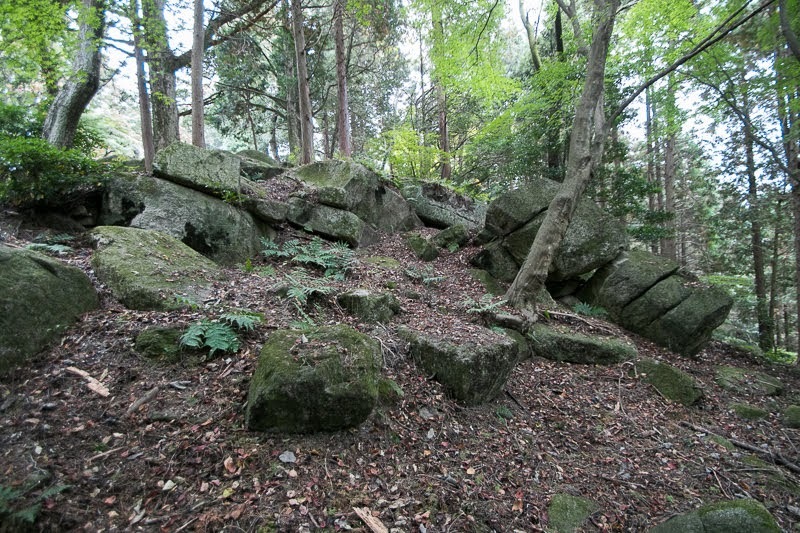 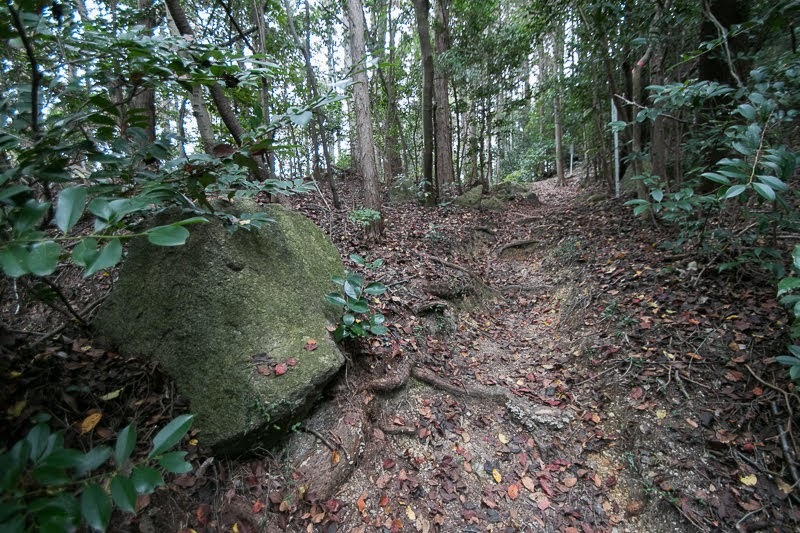 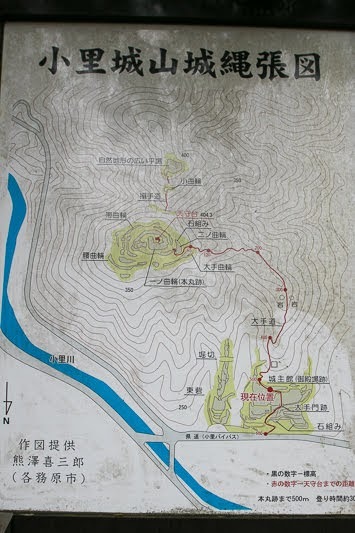 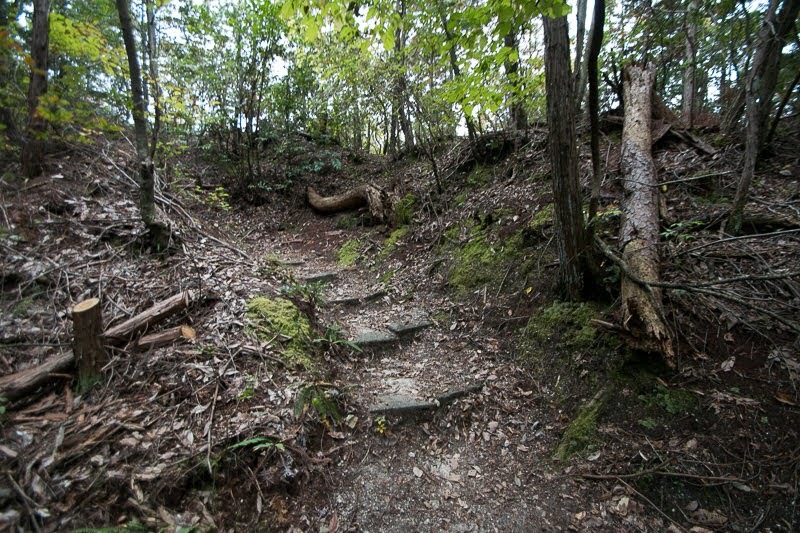 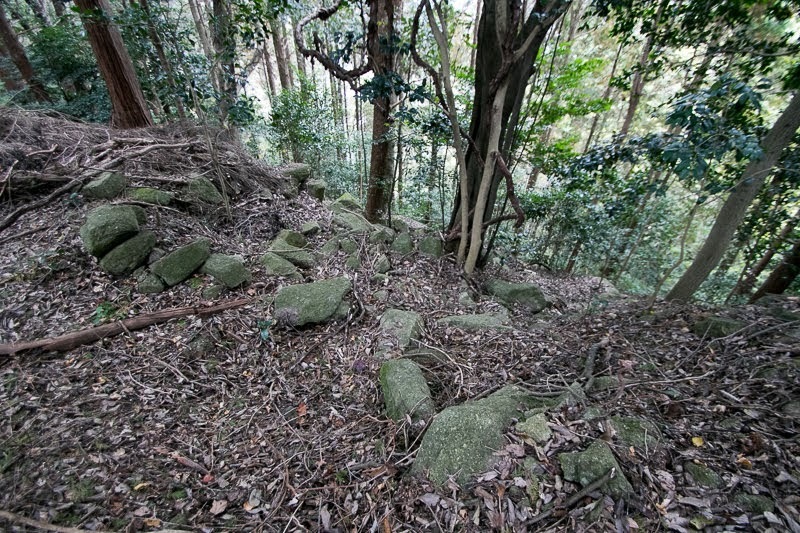 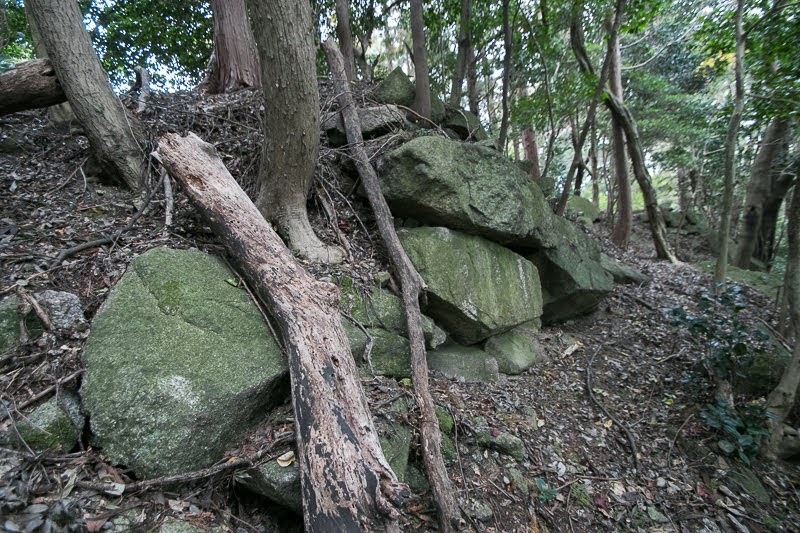 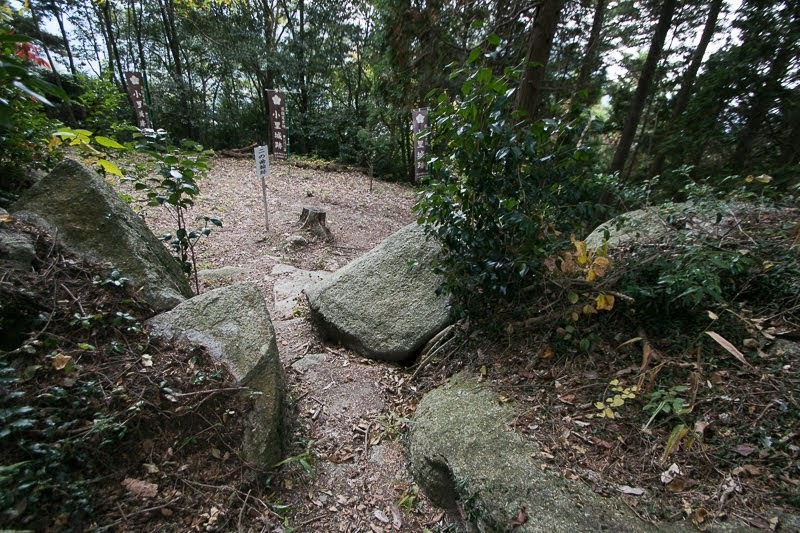 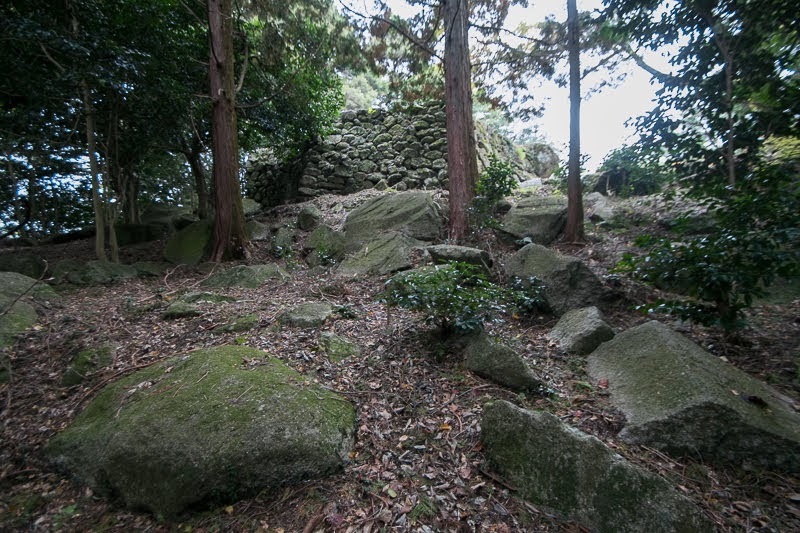 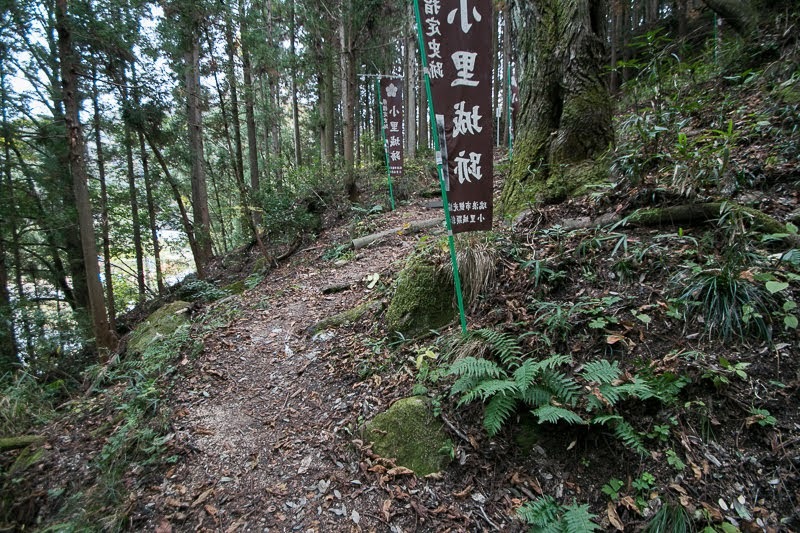 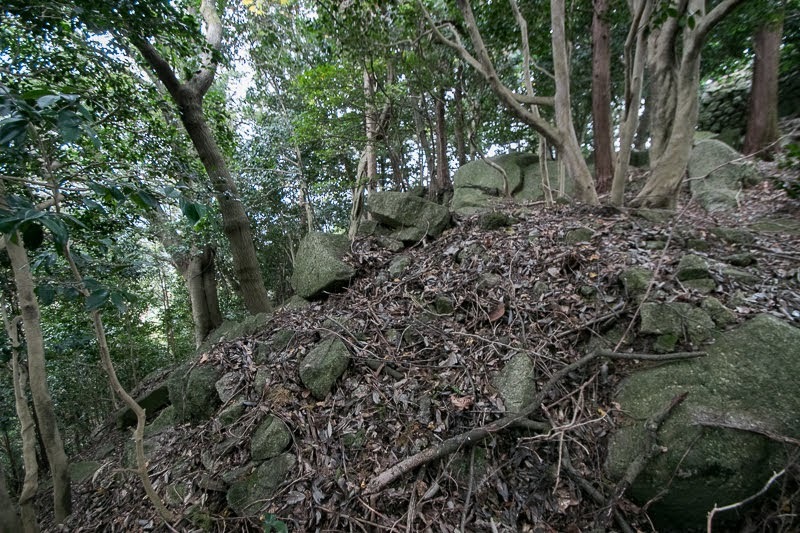 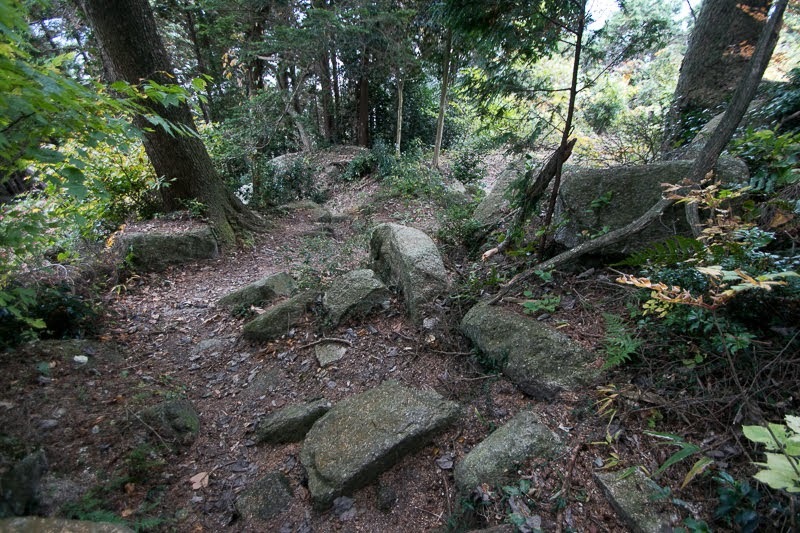 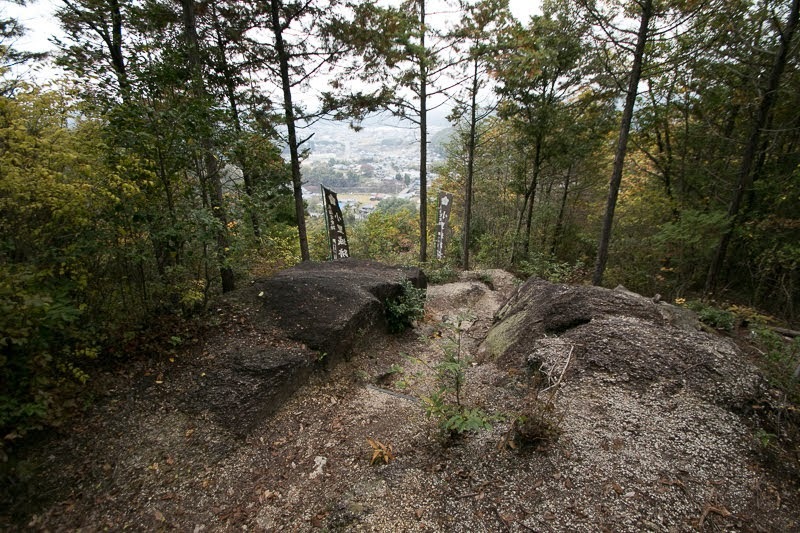 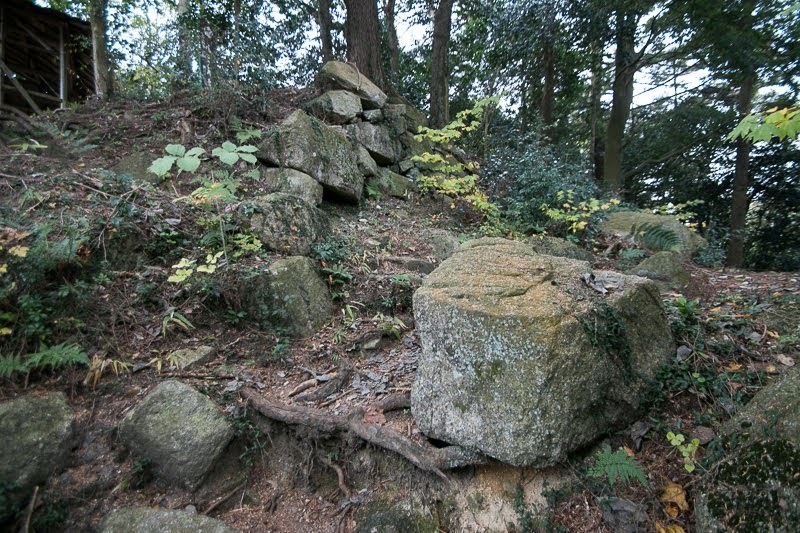 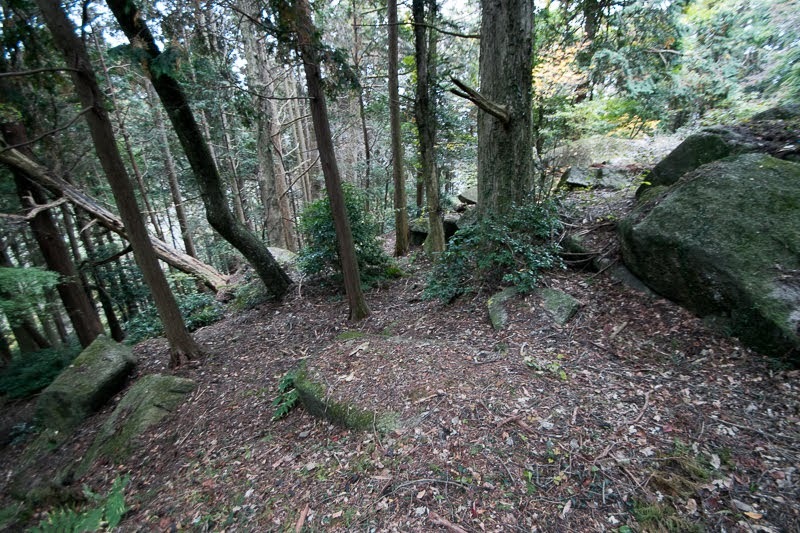 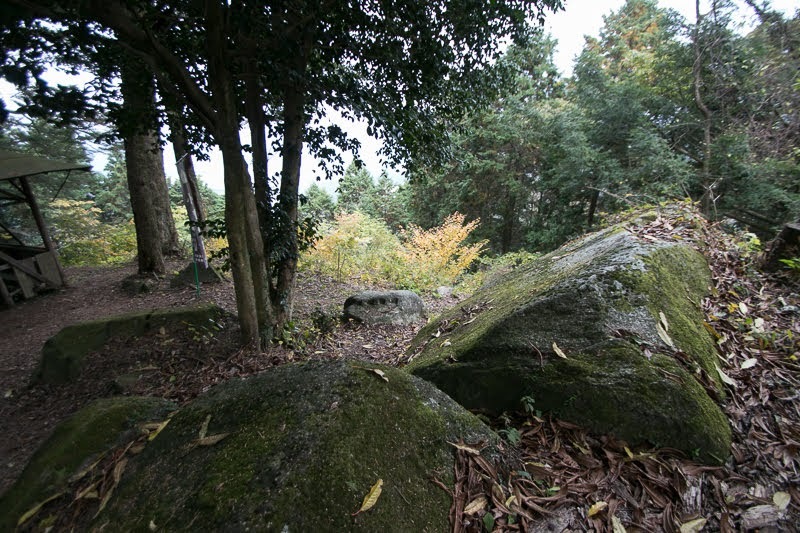 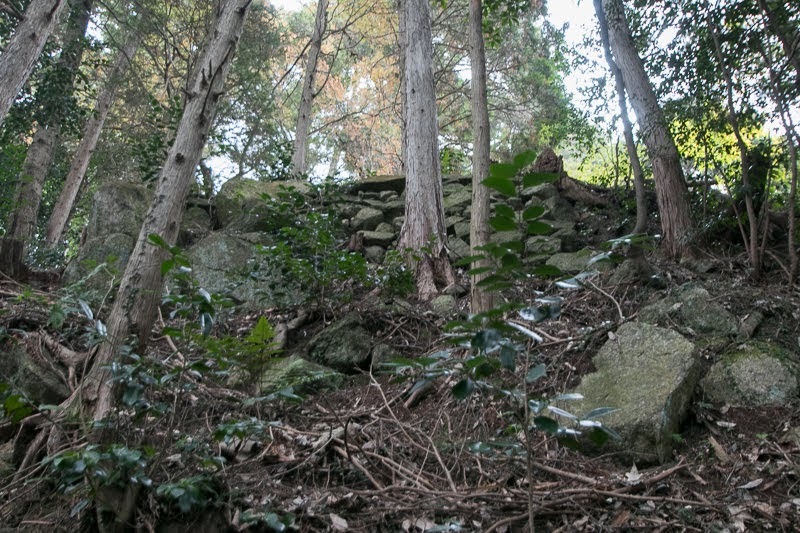 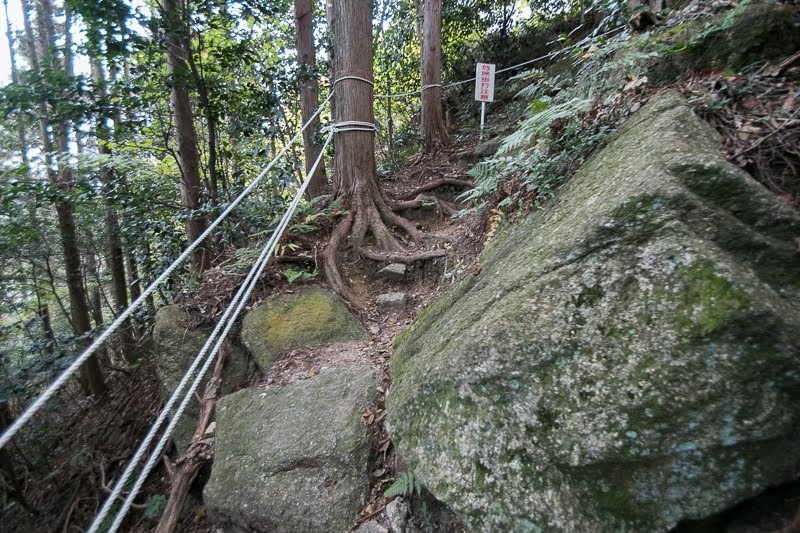 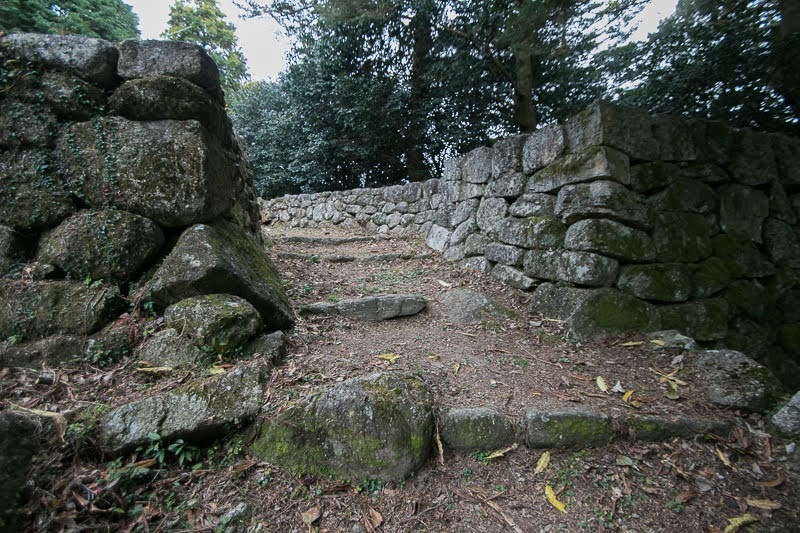 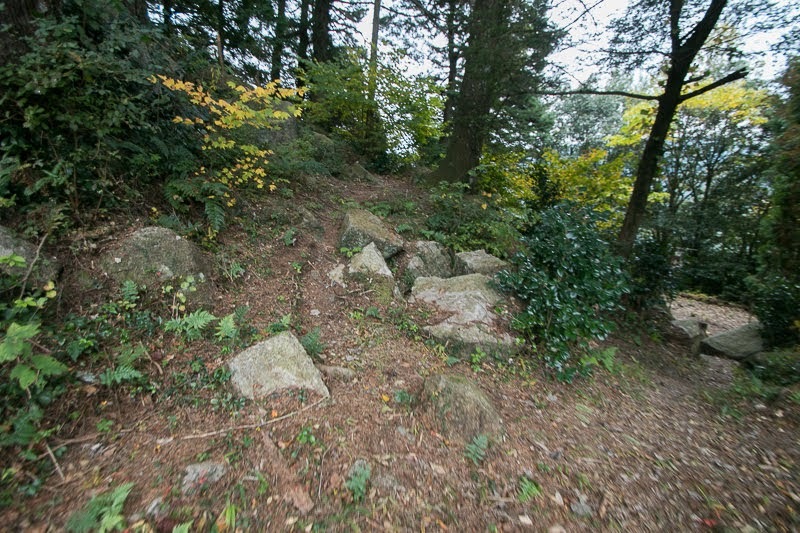 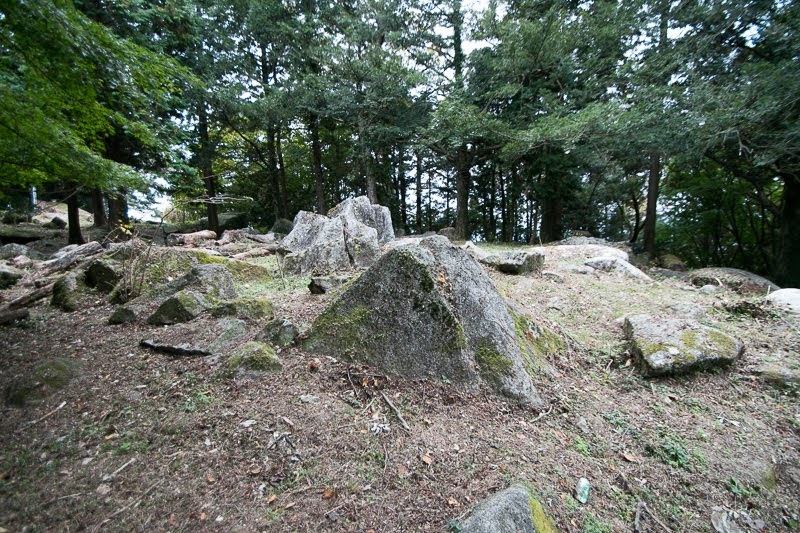 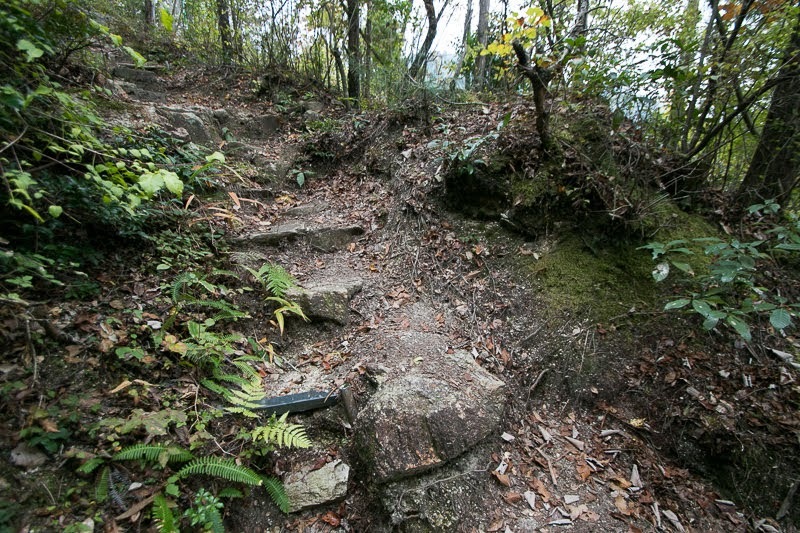 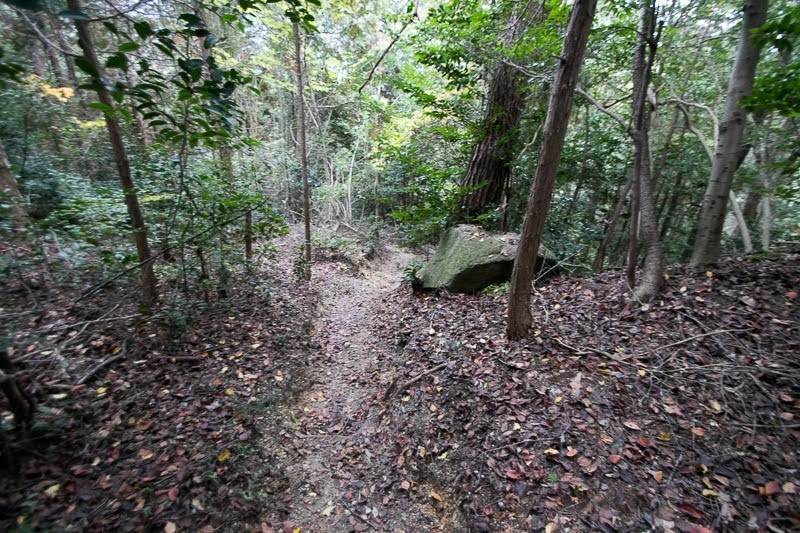 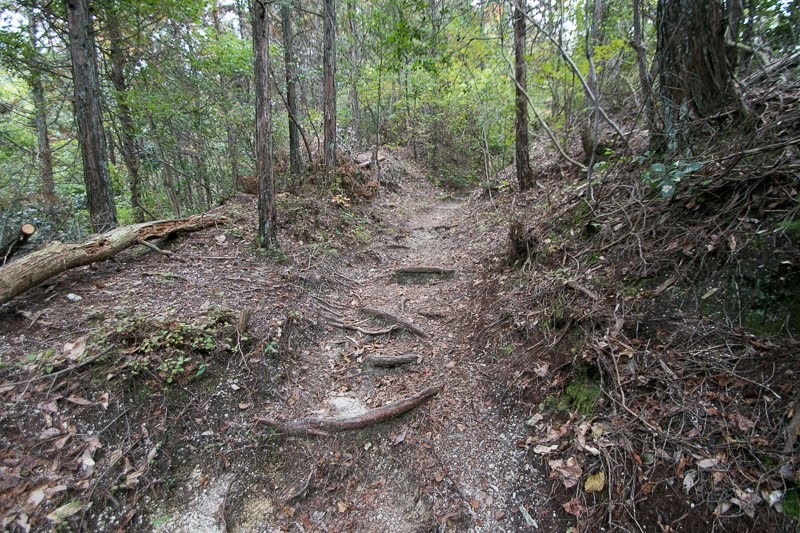 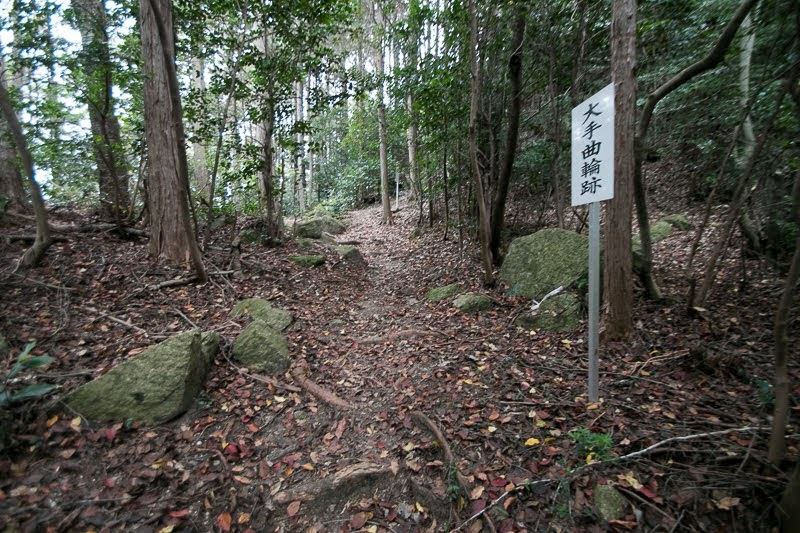 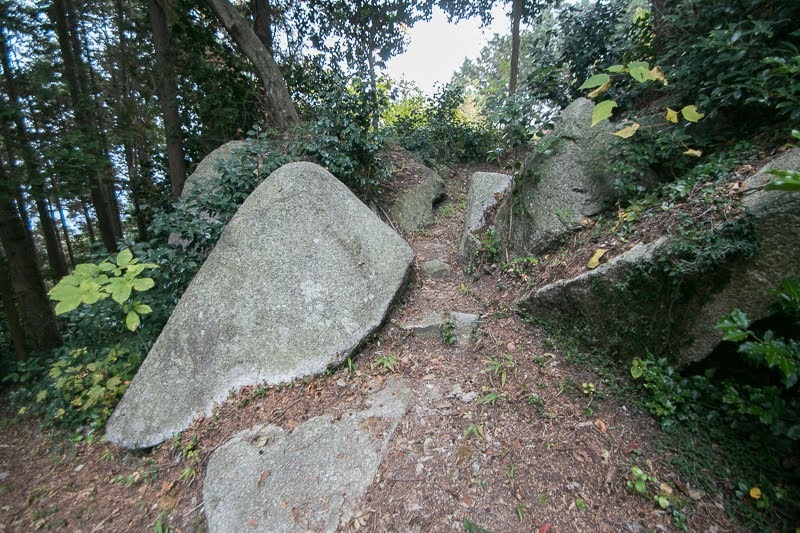 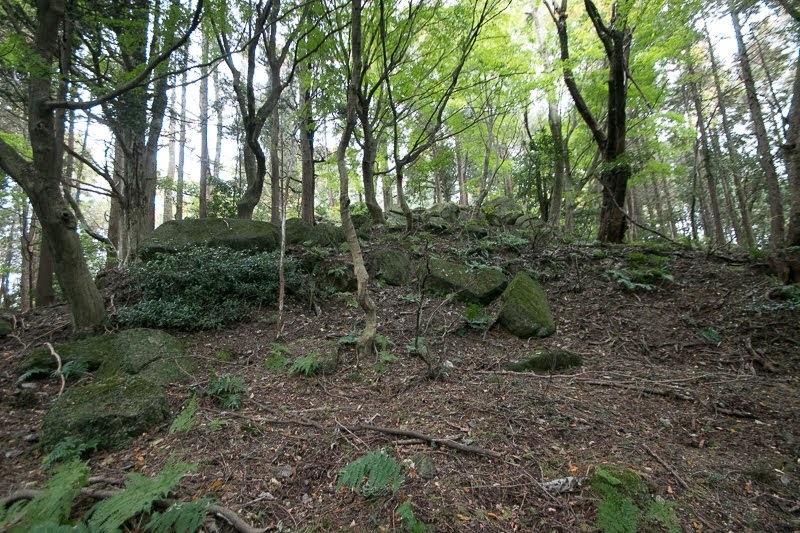 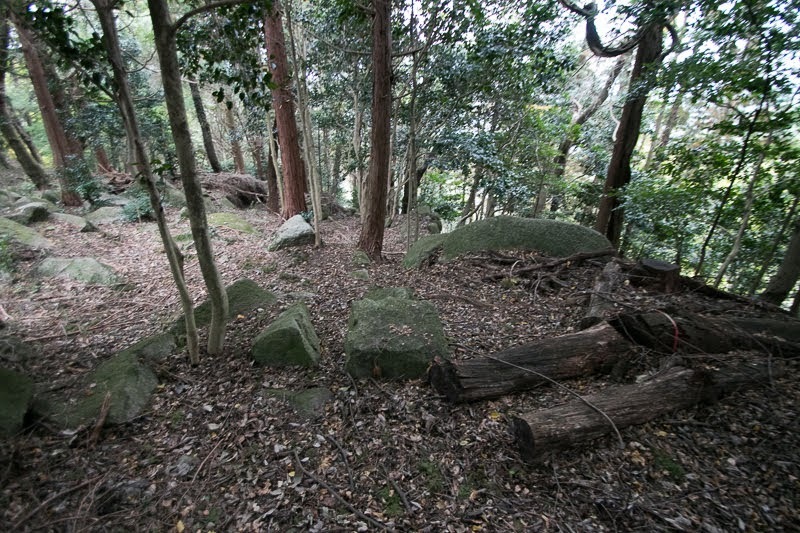 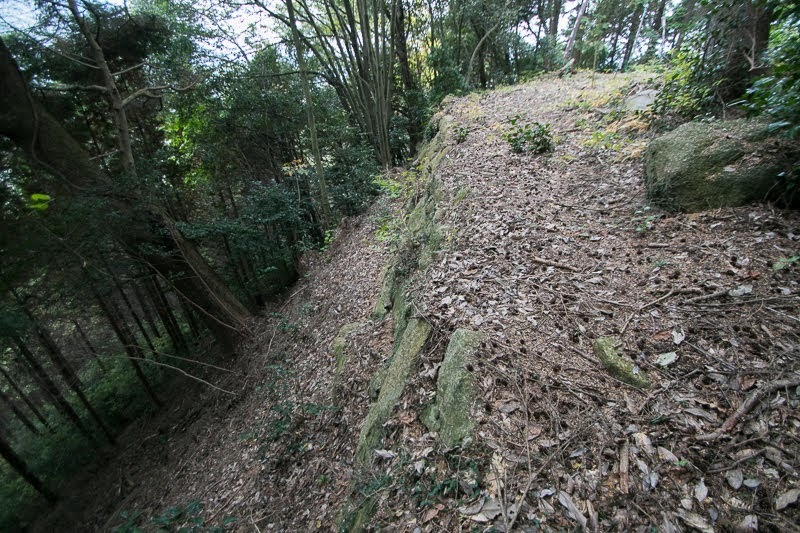 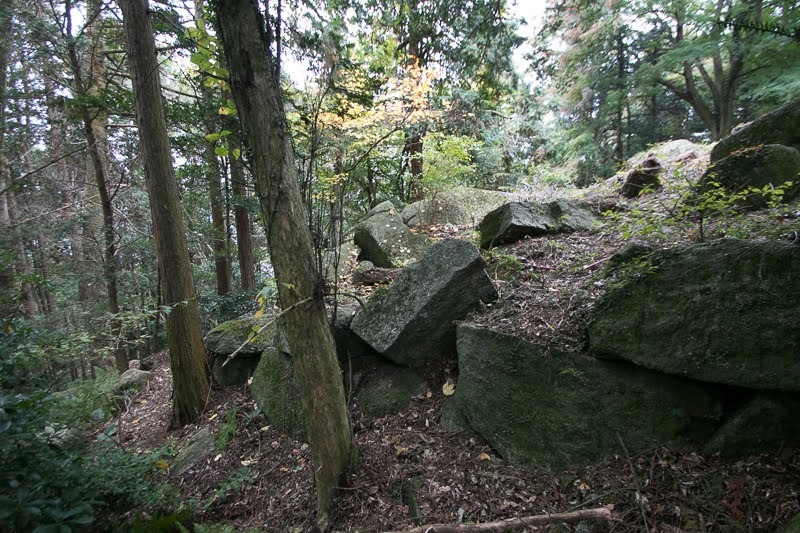 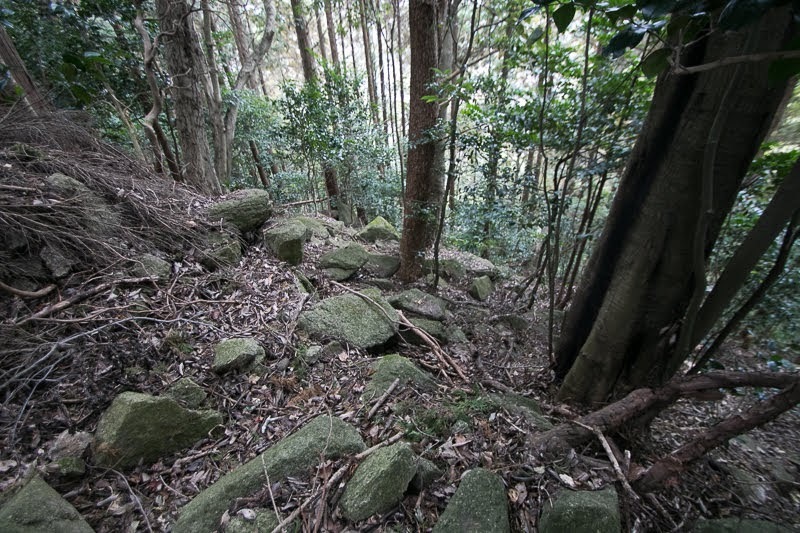 At the north slope of central area, there are small terraces such as secondary area and entrance area which are partially protected by stone walls. 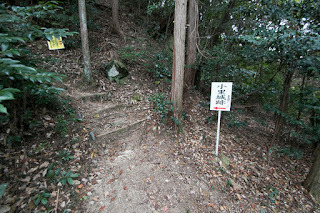 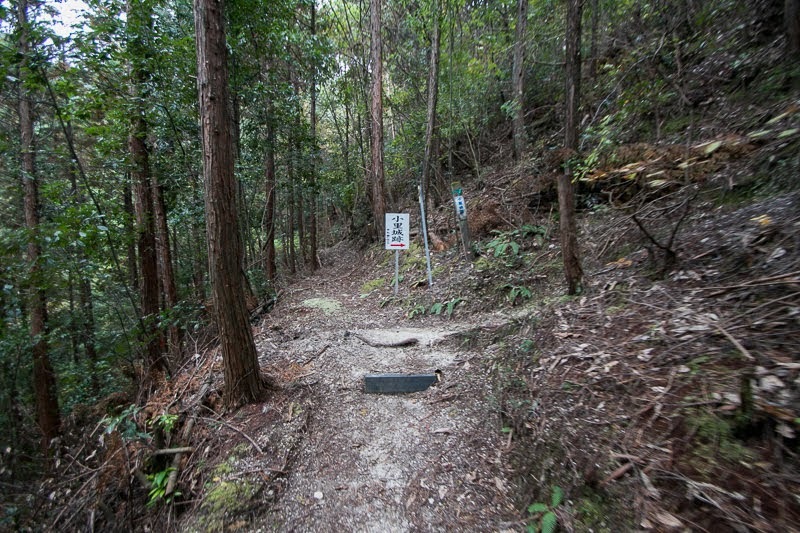 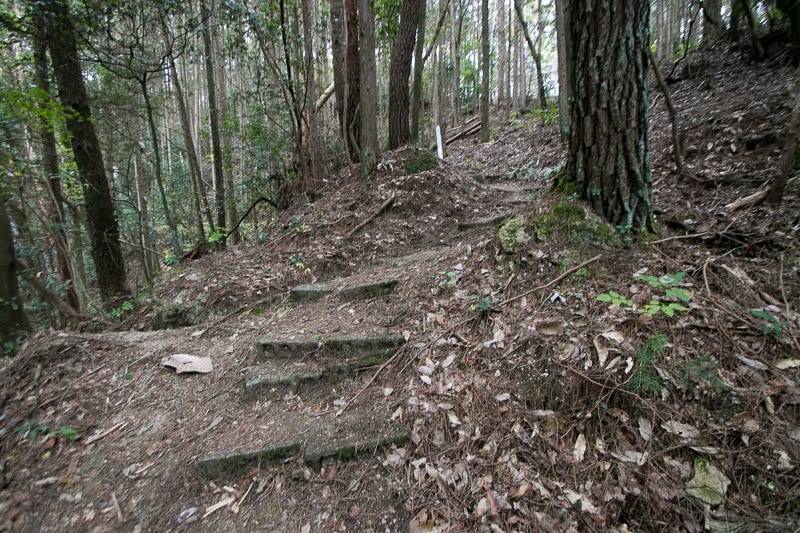 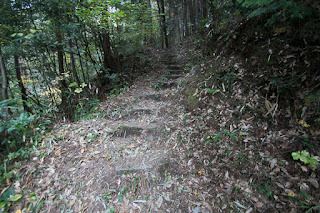 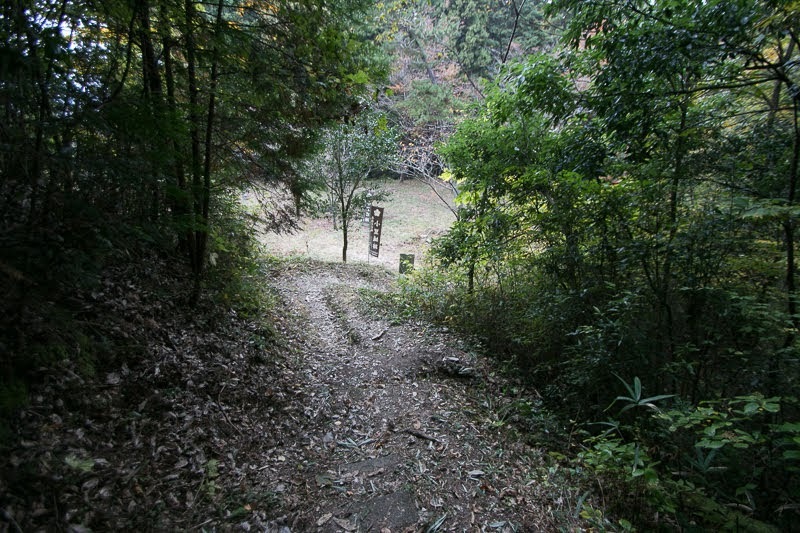 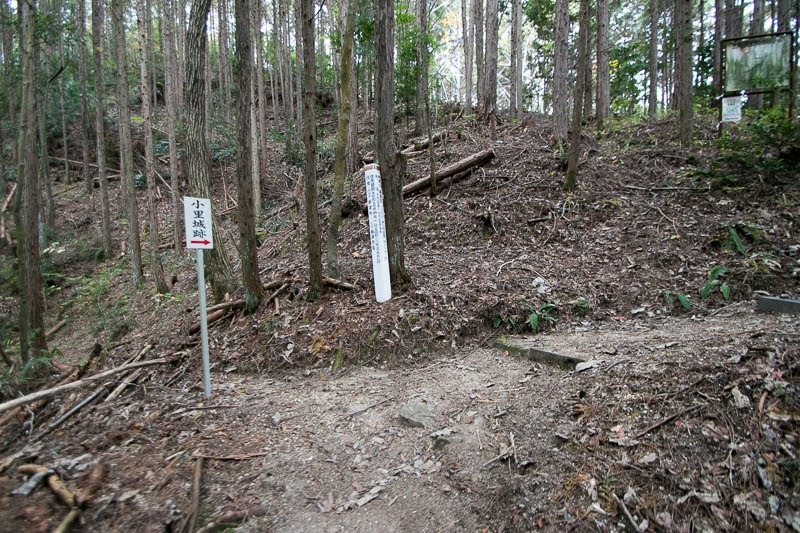 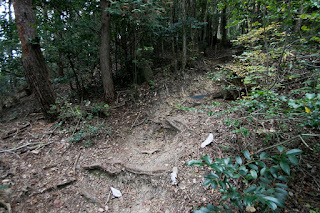 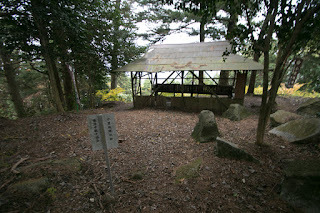 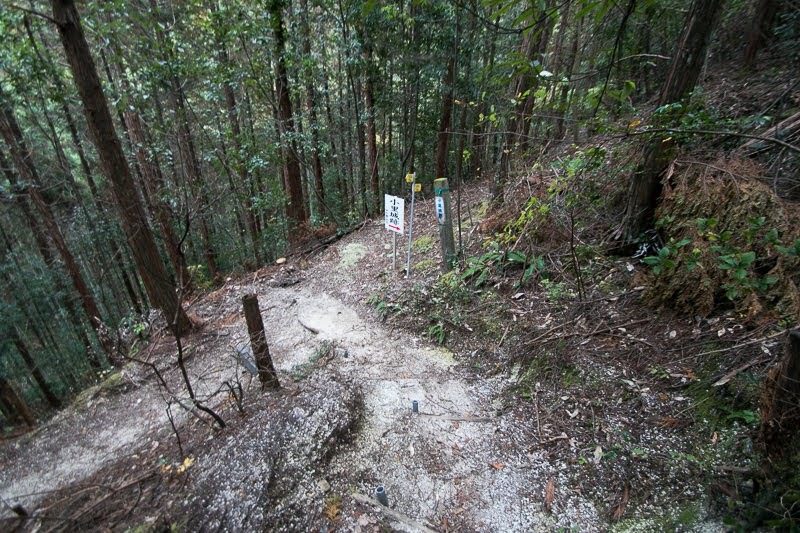 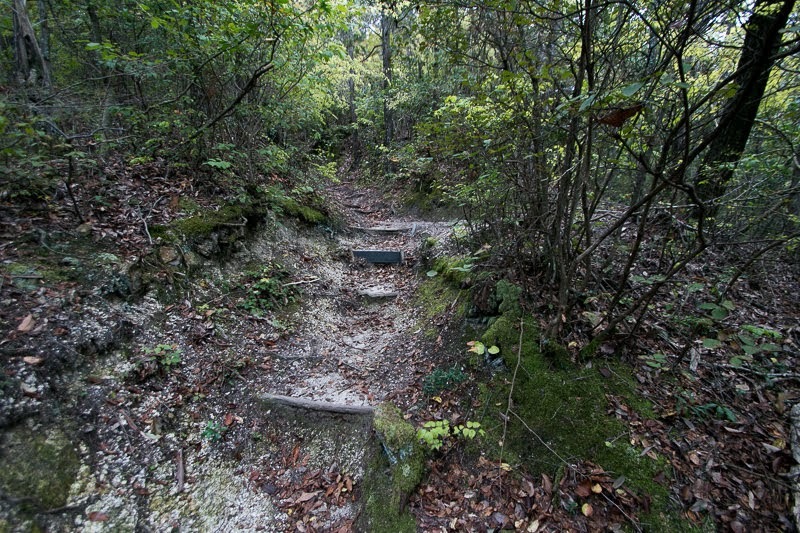 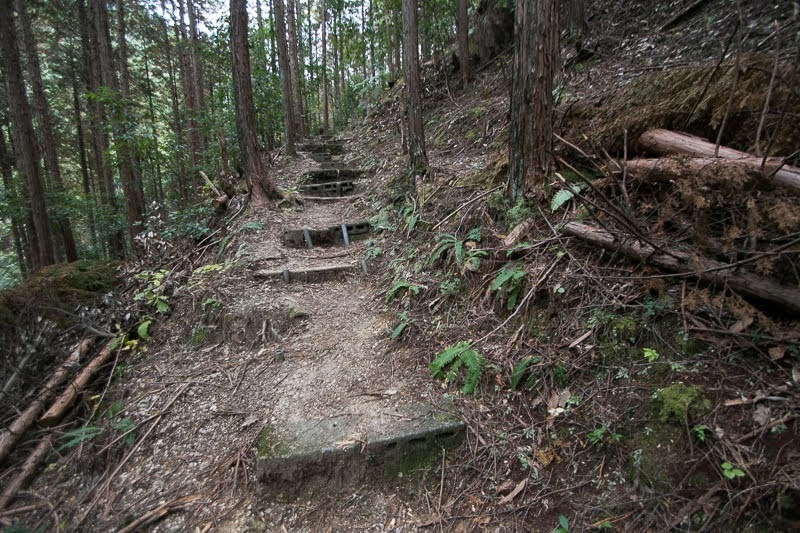 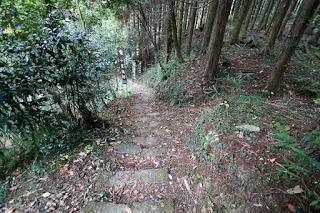 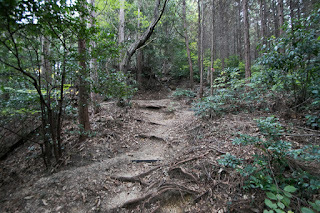 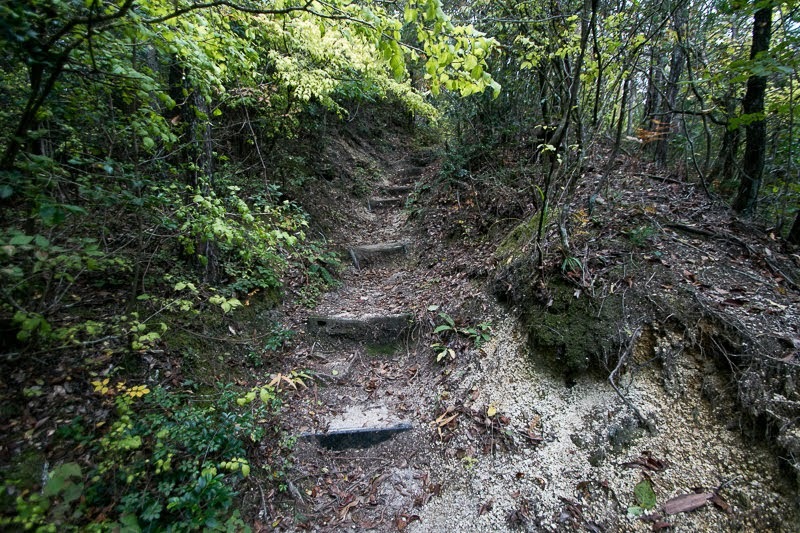 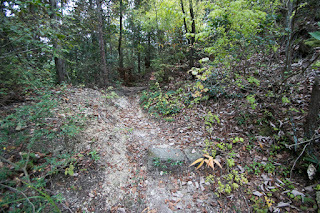 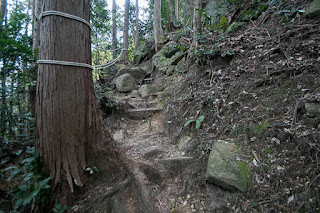 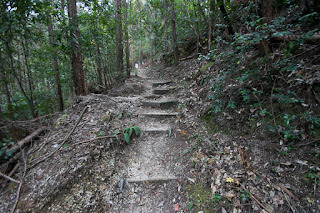 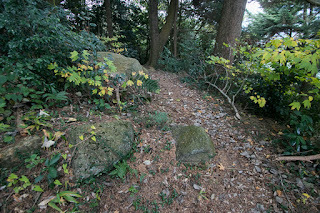 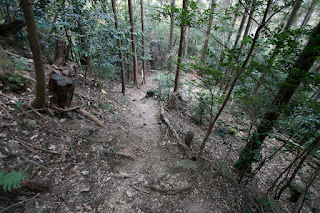 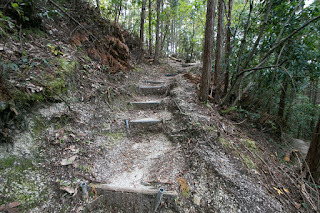 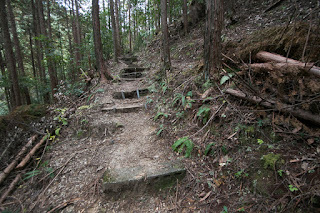 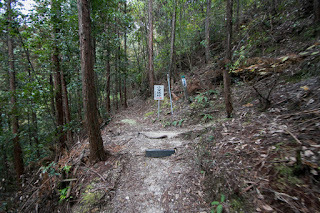 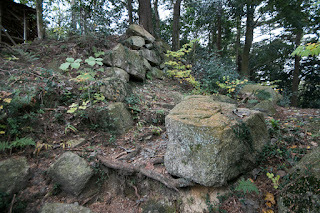 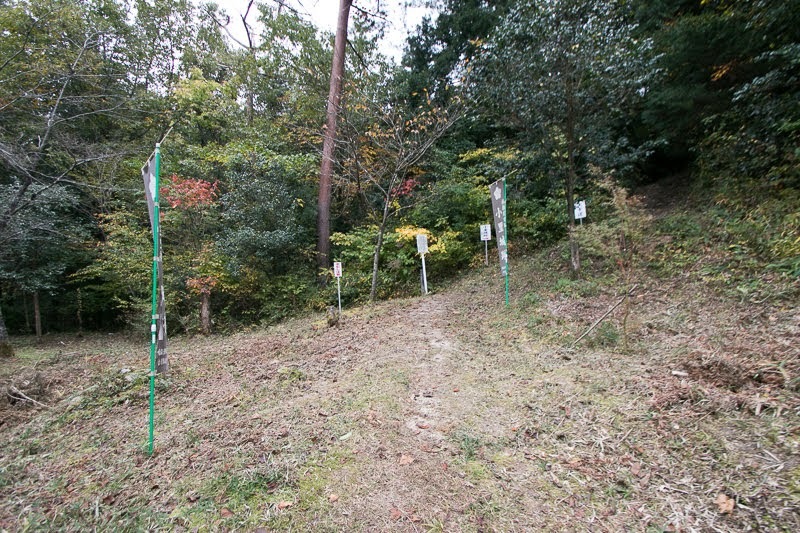 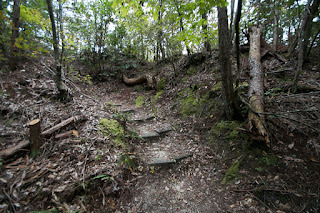 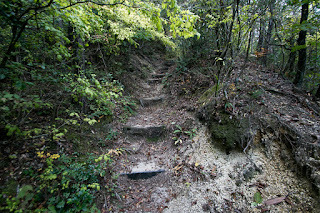 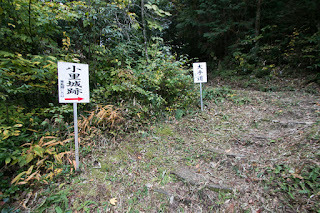 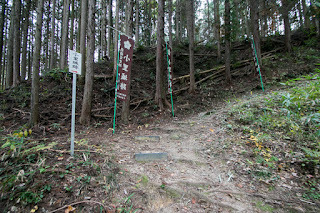 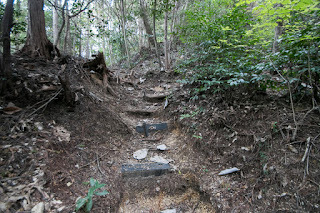 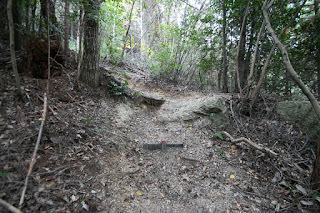 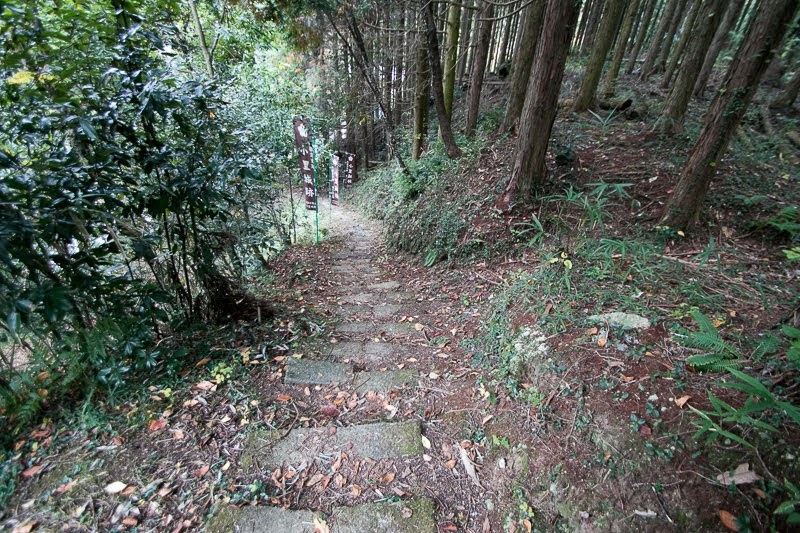 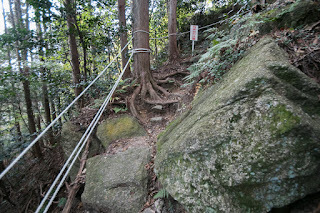 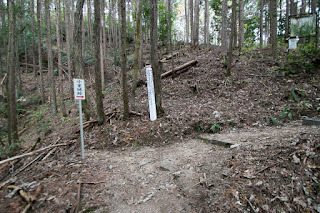 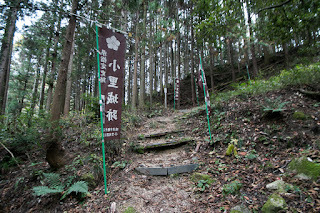 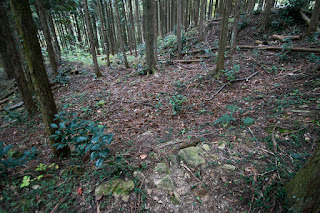 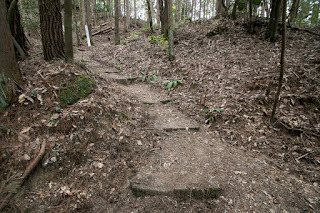 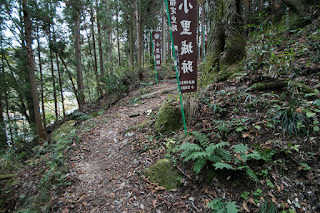 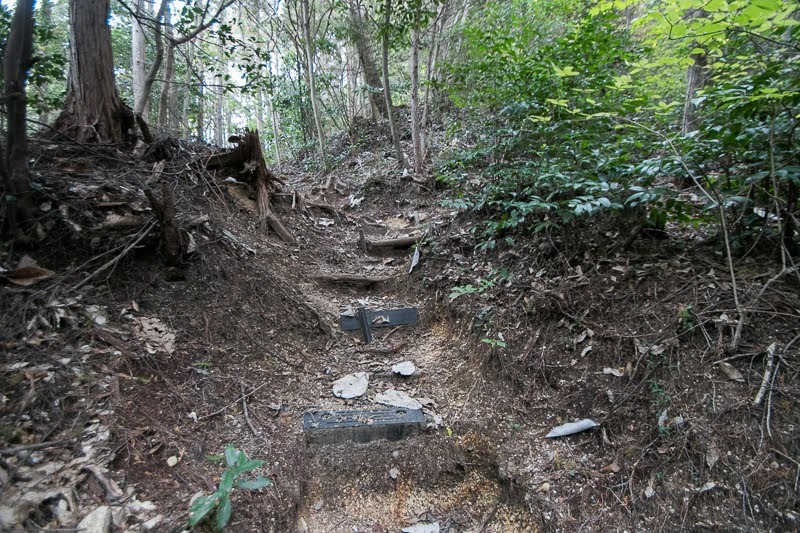 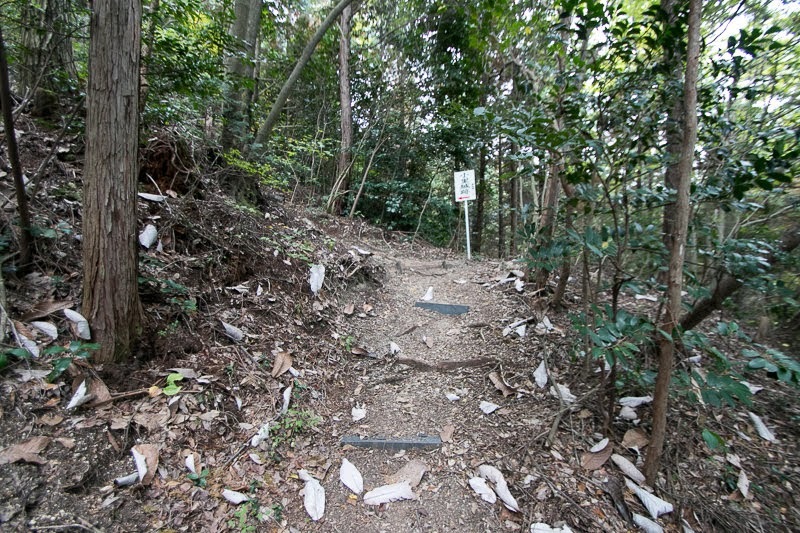 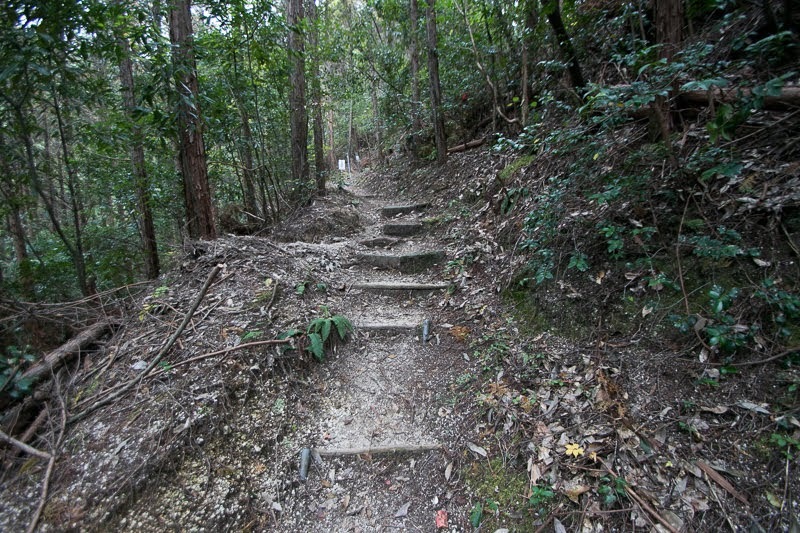 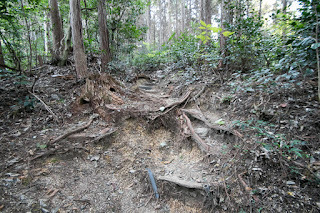 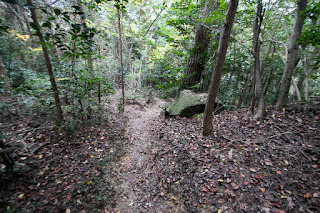 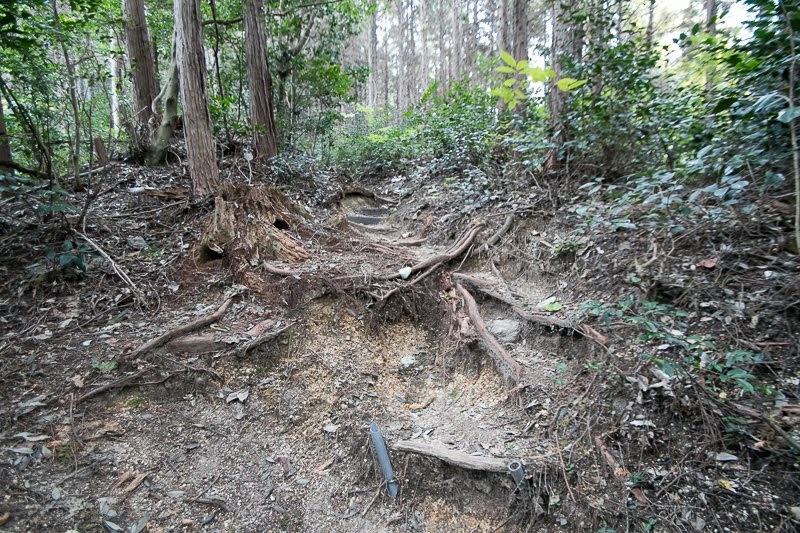 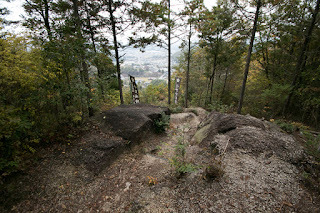 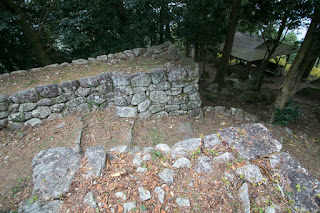 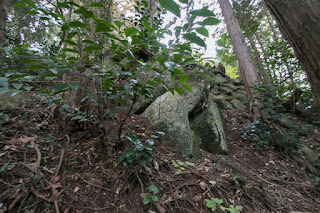 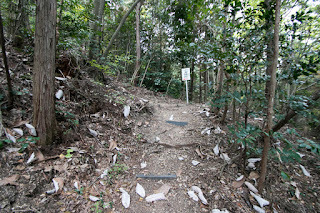 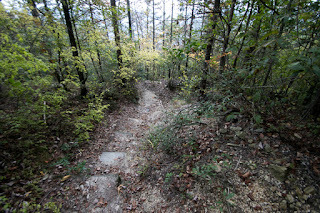 On the way of climbing road from hillside there are several ruins of gates. 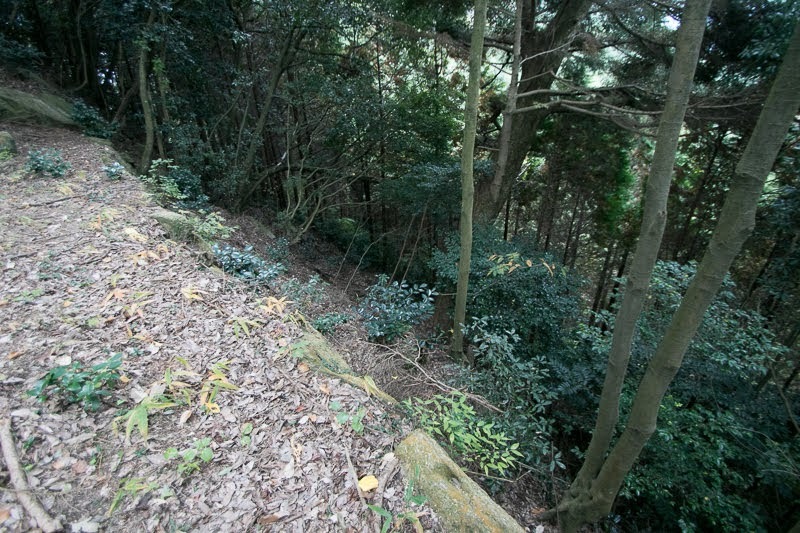 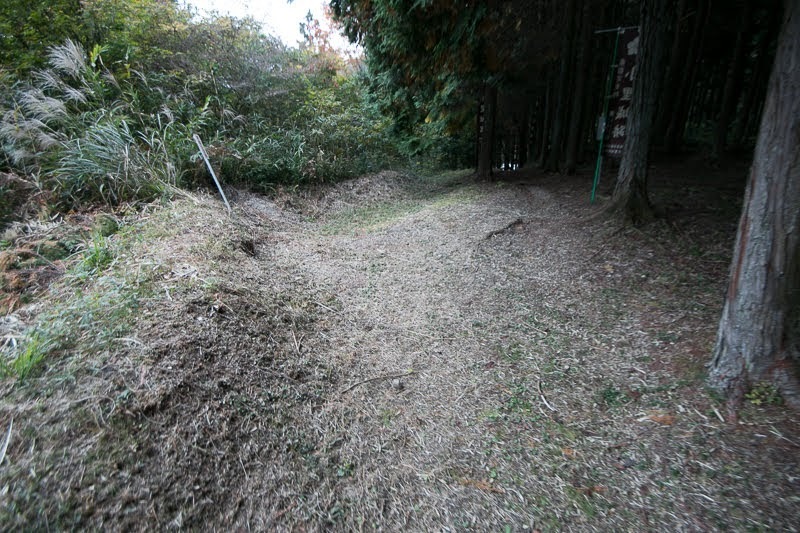 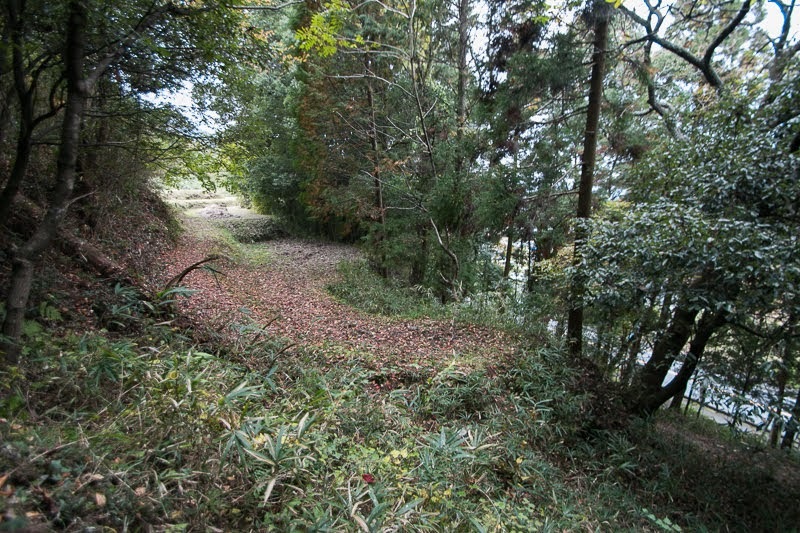 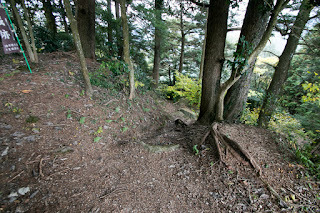 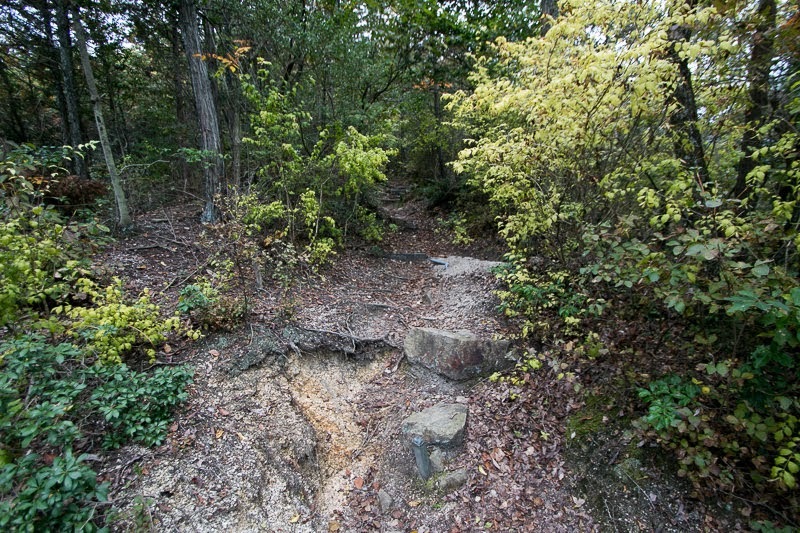 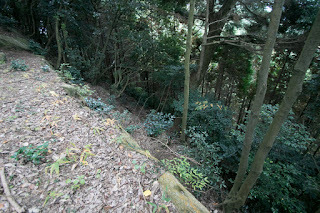 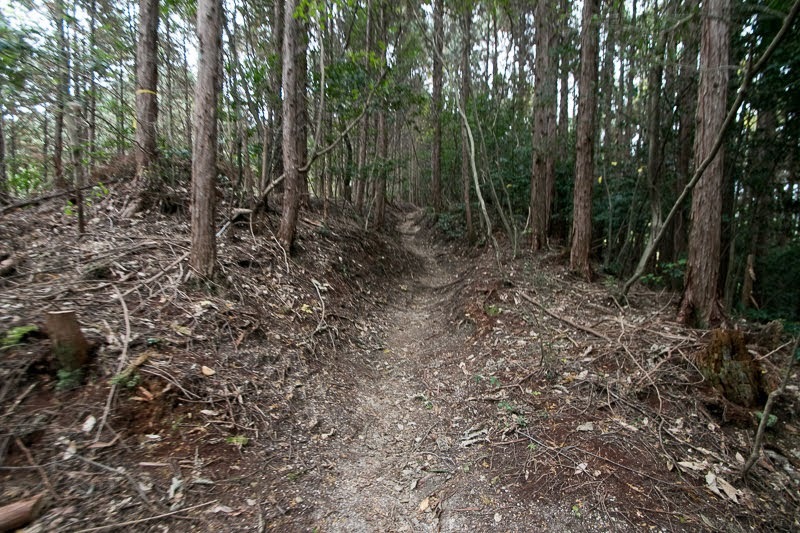 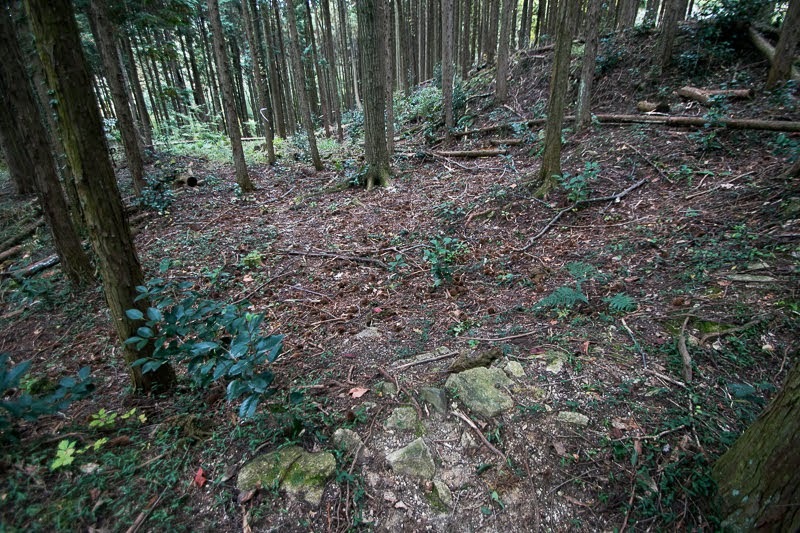 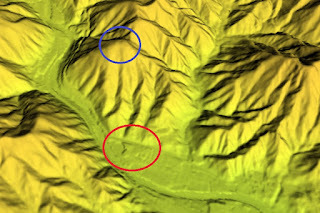 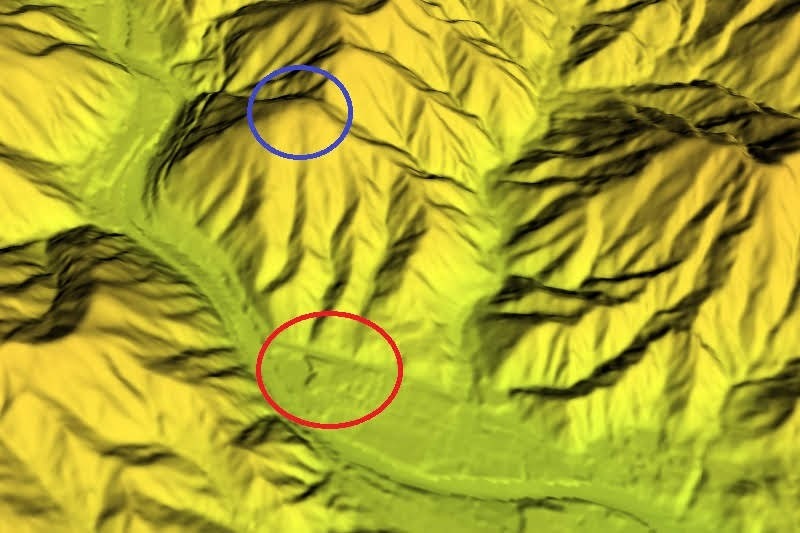 Hillside area is a two layer of flat area separated by clay wall. 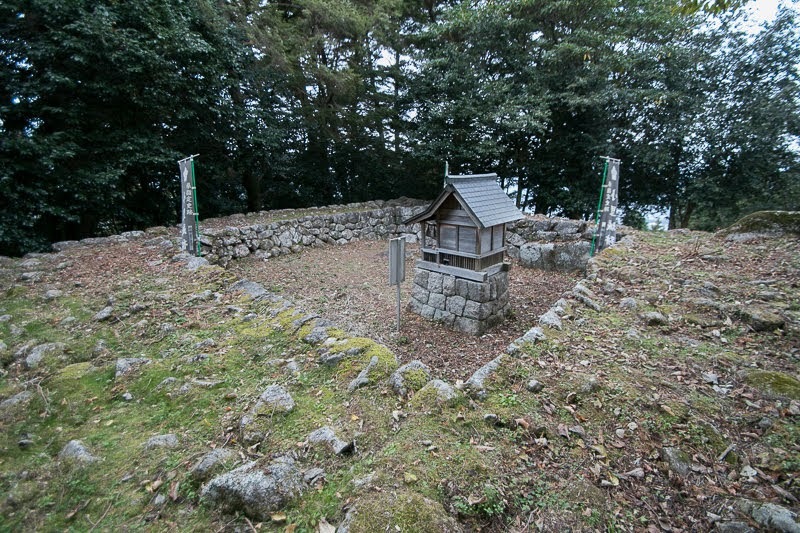 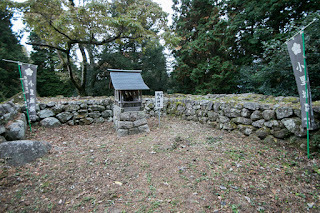 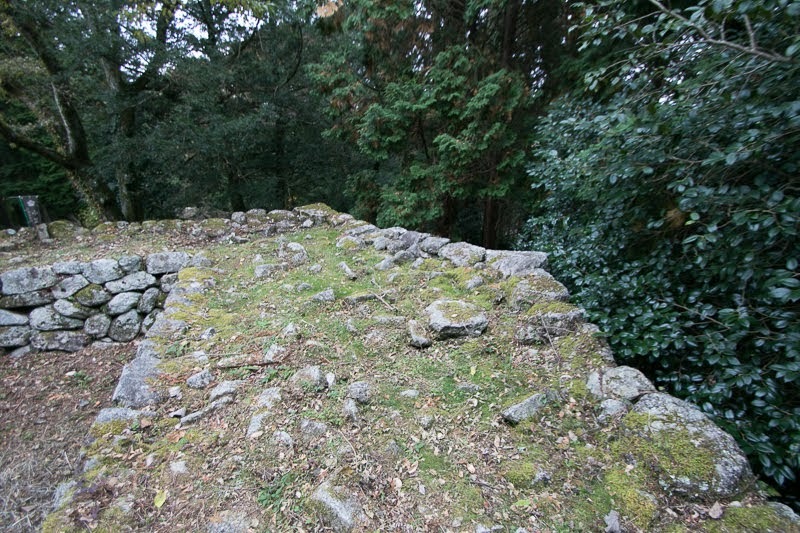 North line of lower area is protected by the line of stone wall, which has basement of turret and gate. 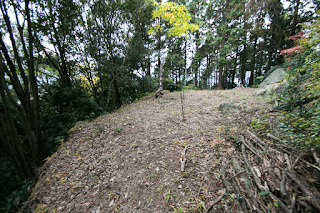 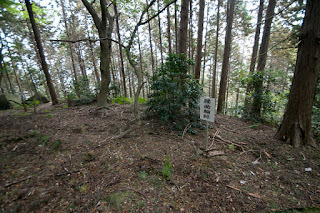 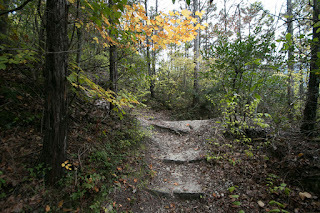 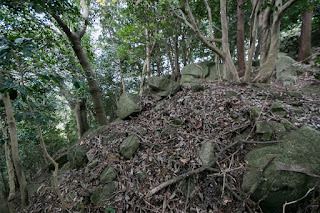 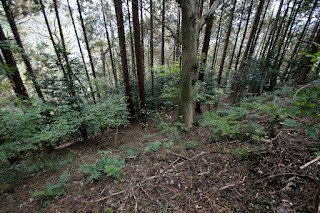 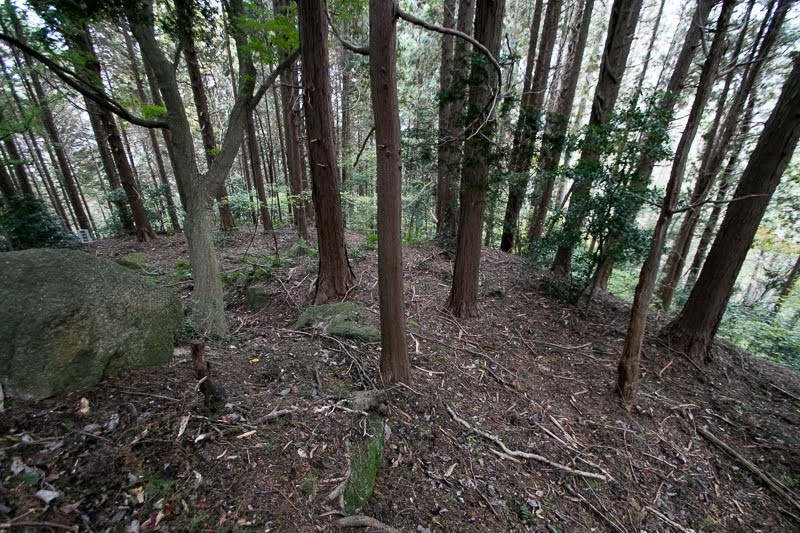 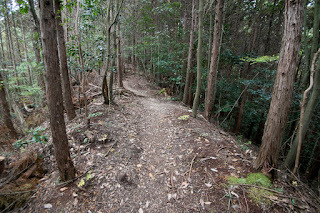 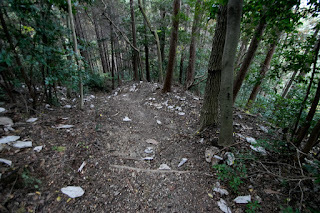 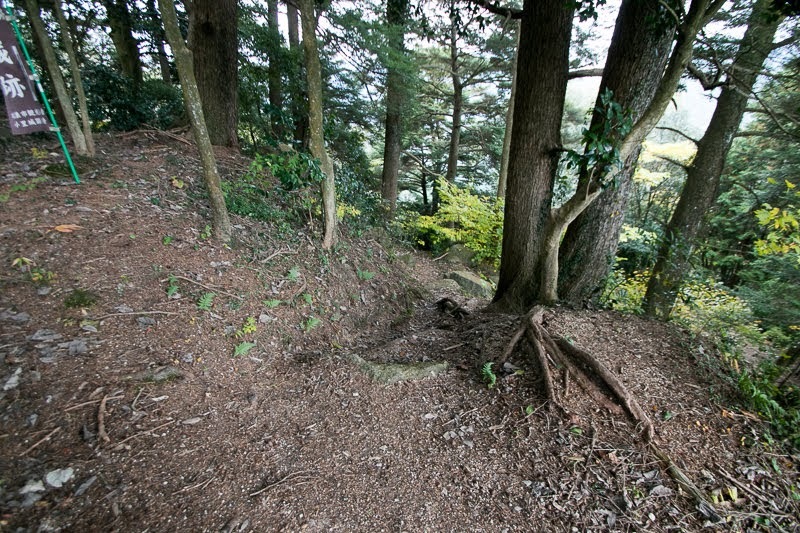 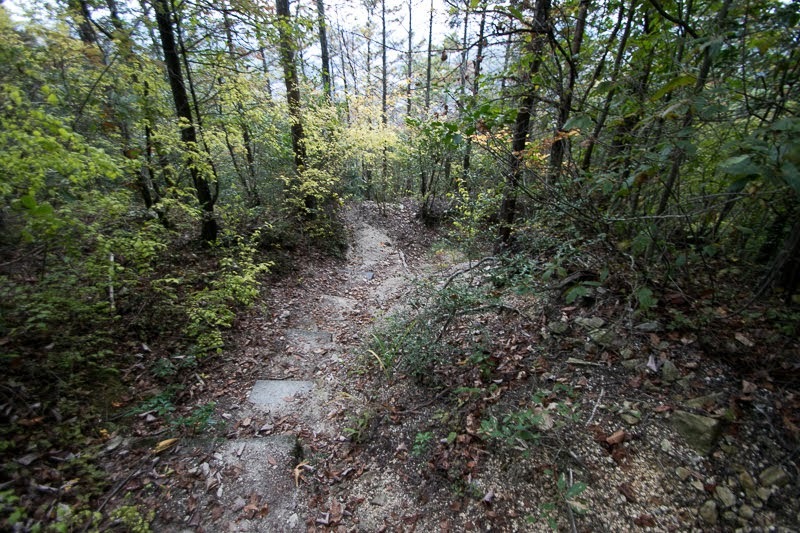 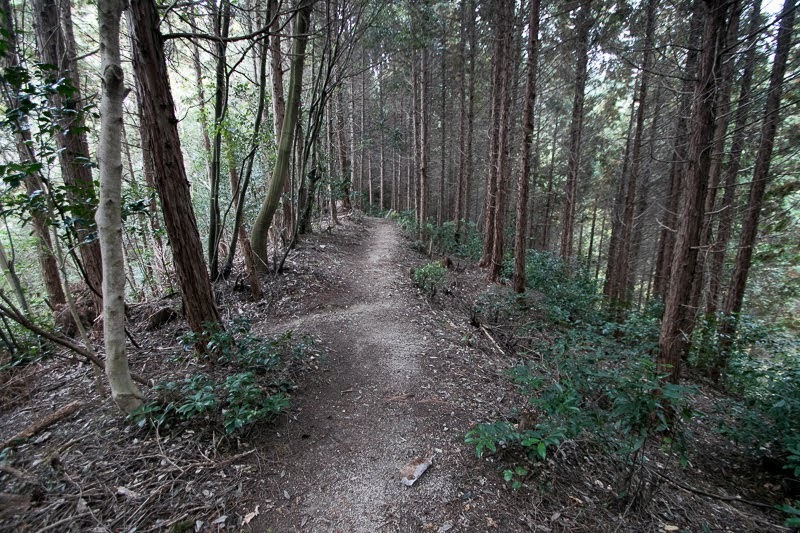 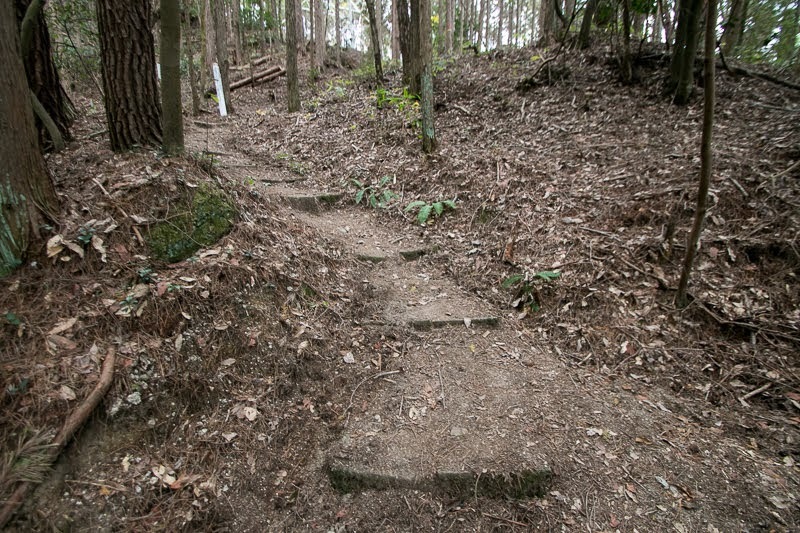 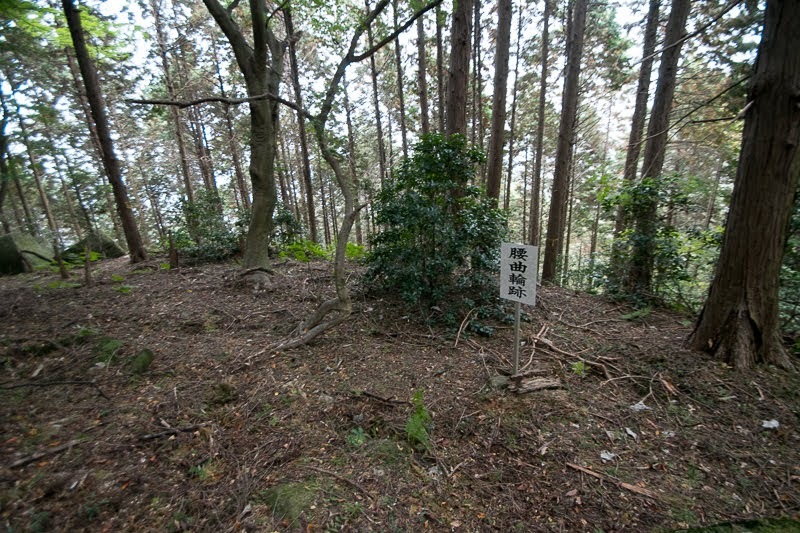 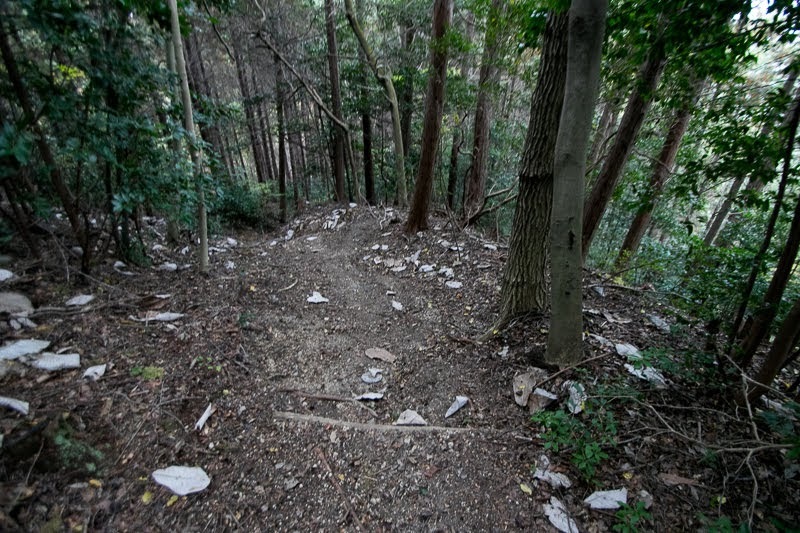 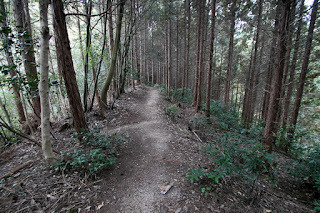 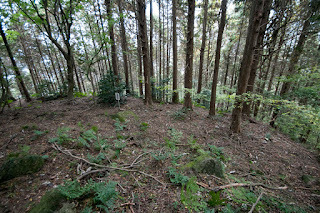 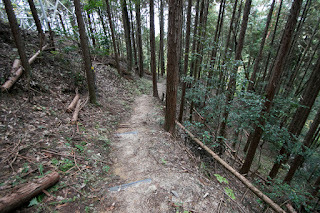 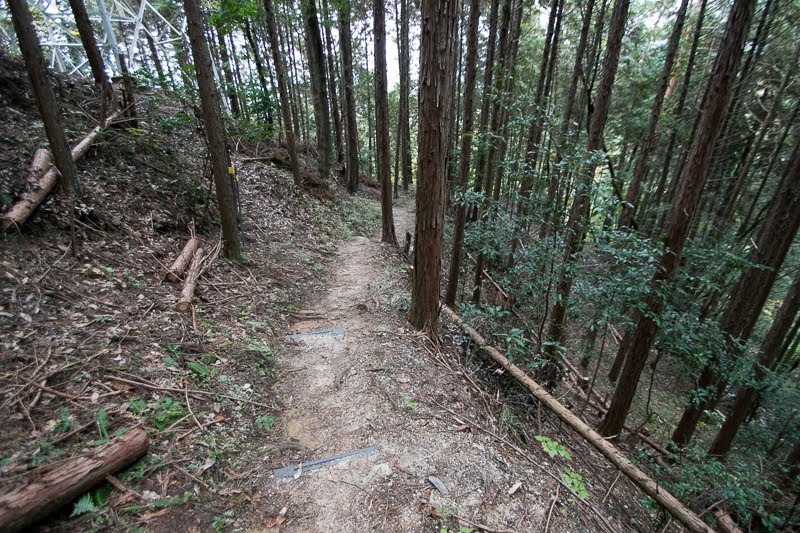 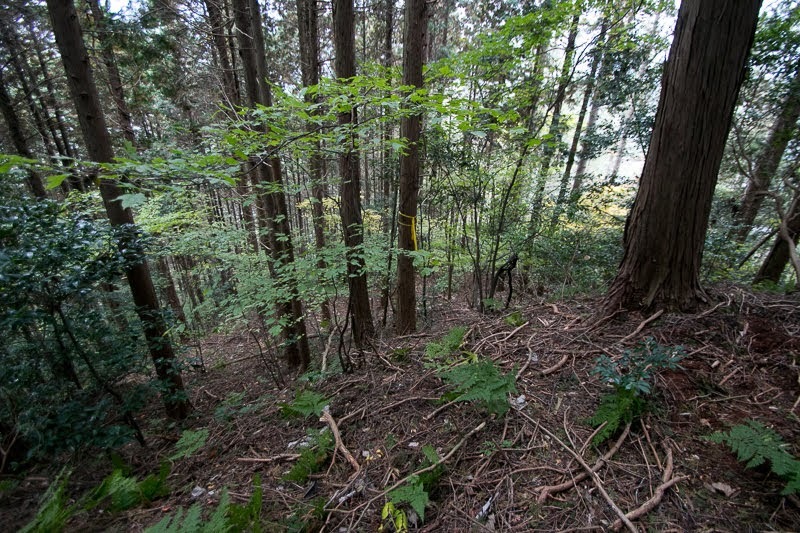 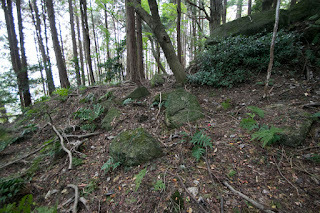 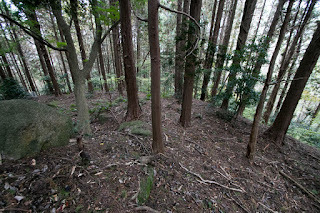 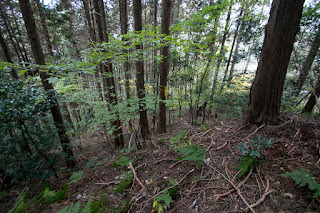 Size of hillside area is about 50 meter long and 30 meter wide, and there might be several buildings of the lord. 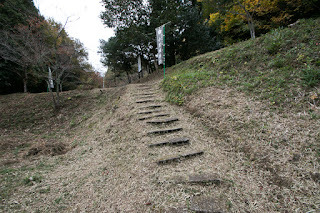 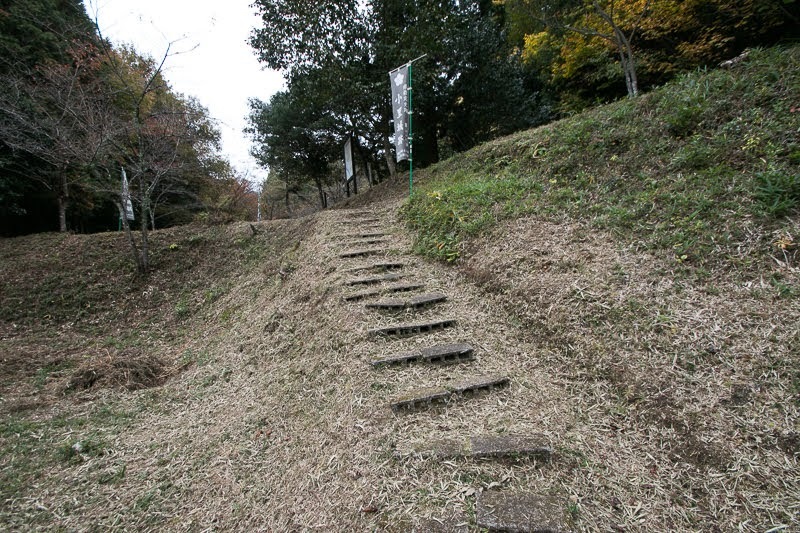 Facing the threat of Takeda army, Nobunaga placed his favorite general Tsuneoki Ikeda (1536-1584) and hastened the construction of the castle. 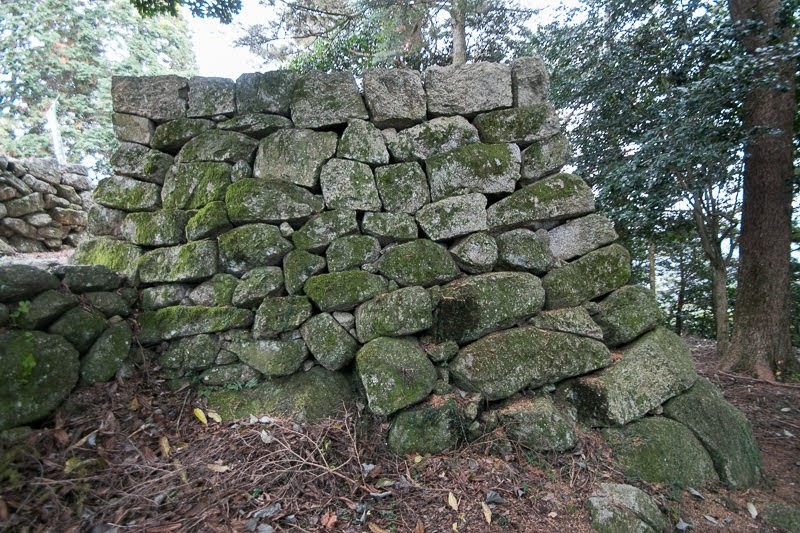 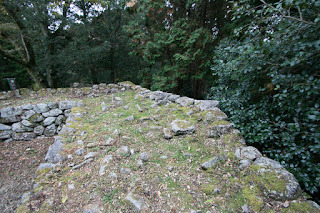 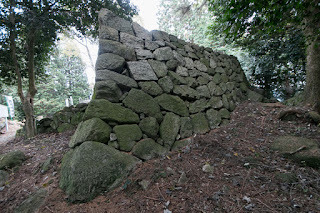 Stone walls of the castle consists of roughly divided stone and this shows time limitation for construction. However, in 1575, Nobunaga and Ieyasu thoroughly broke Takeda army at the battle of Nagashino, then Oda army fell Iwamura castle. Now that there is no necessity of reforming this castle any more, and construction was cancelled. 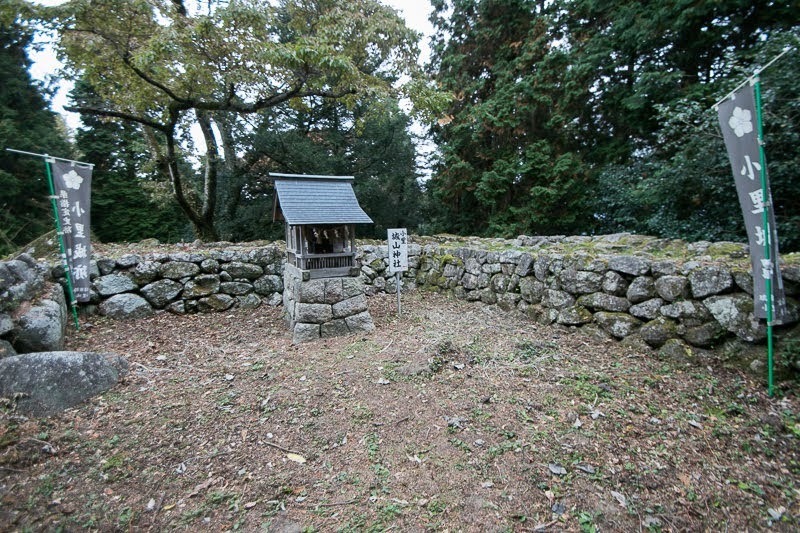 At the point of cancellation, basement of main tower was completed and stonewalls surrounding central areas were under construction. 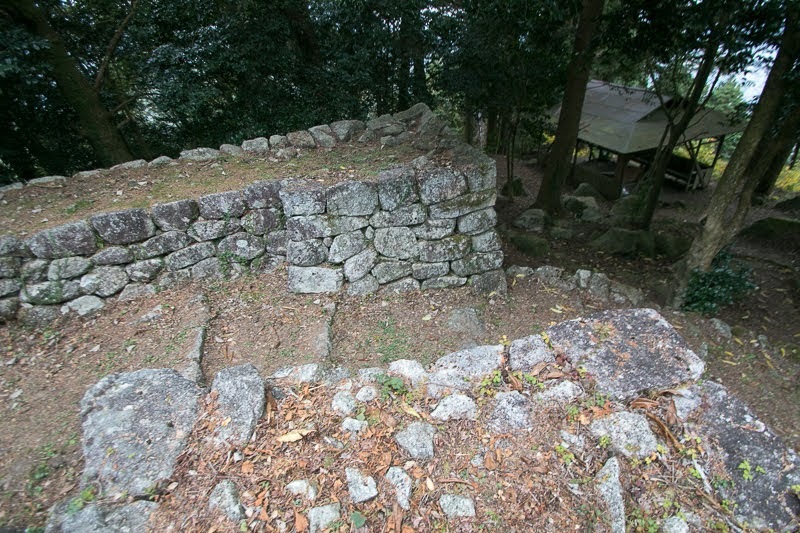 Basement of main tower is a scalene polygon shape, and based on its size, a small main tower of two or three story might be planned. 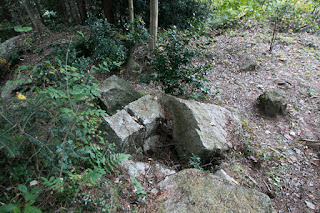 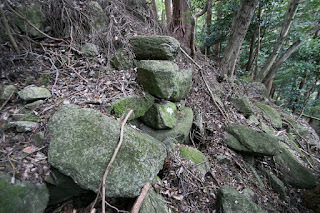 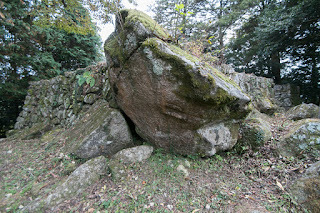 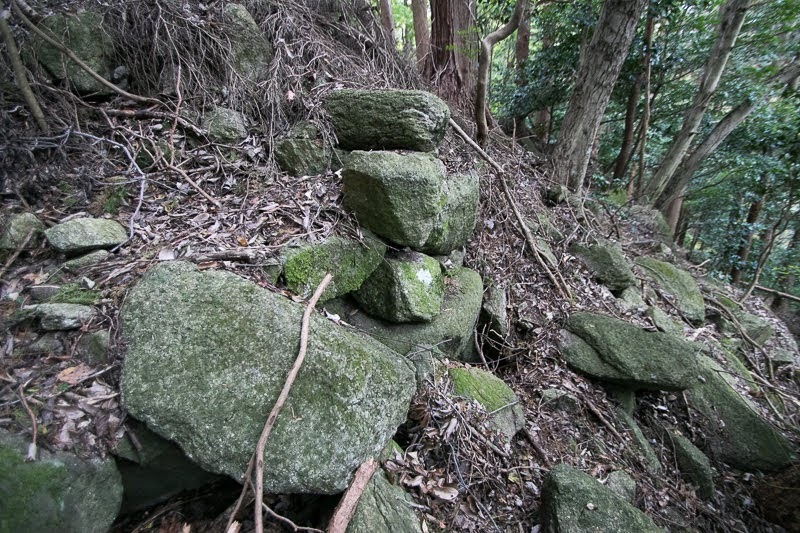 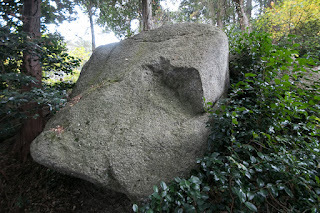 In central area, there remains many large stones prepared for building, and some stones were graved by chisel to cut and shape. 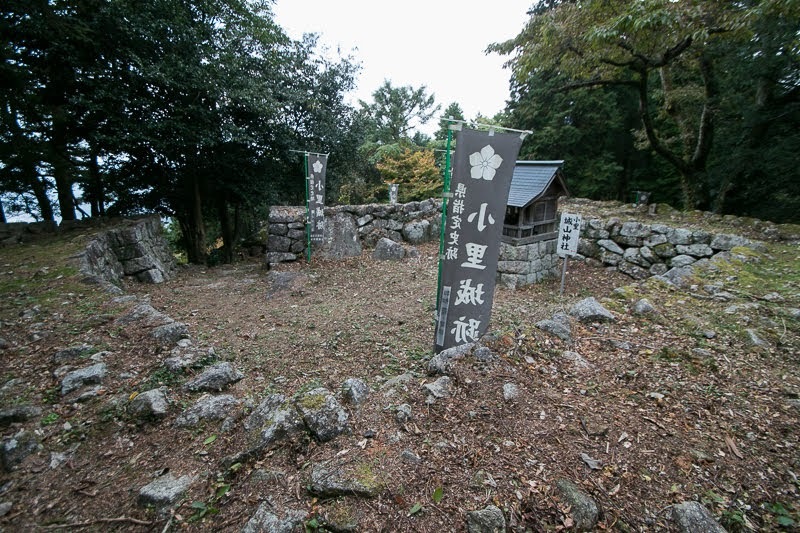 After many complications Ori clan became a small lord of this area under Edo Shogunate, and they built their government office at the foot of the mountain. But they extinguished in 20 years due to having no successor, thus their government office was also abandoned. 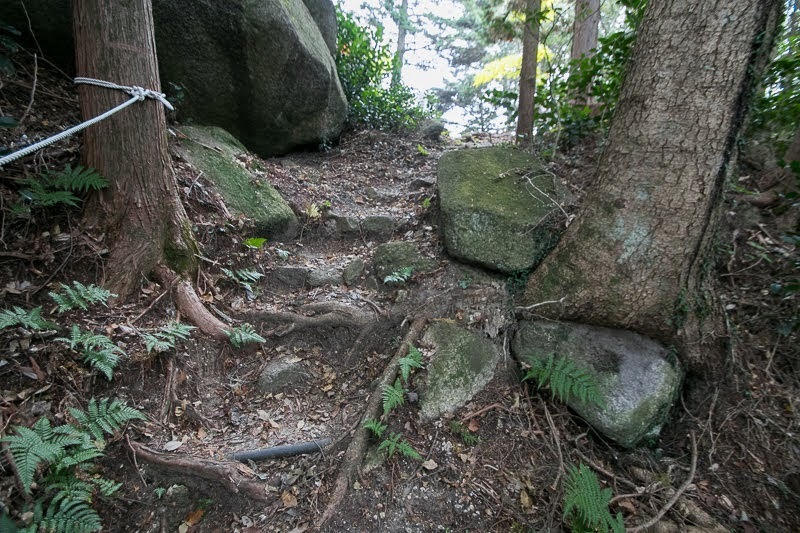 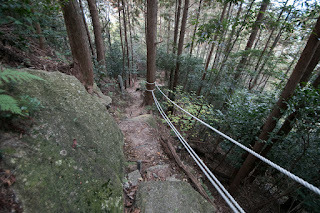 Now stone walls both at the top of mountain and government office area at the foot of the mountain well remain, and tell us the short term history of the lord and castle.